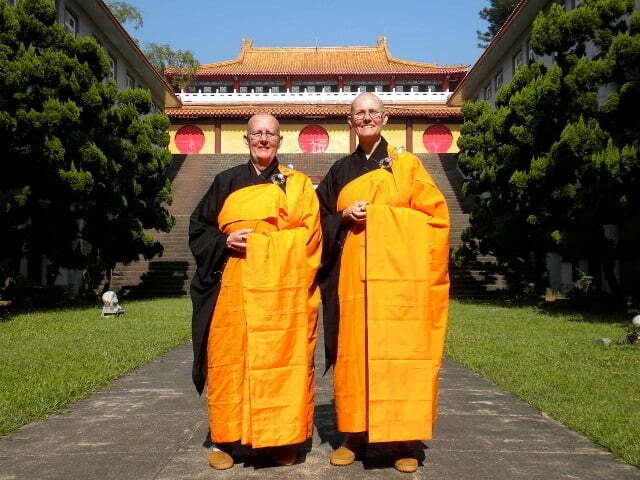 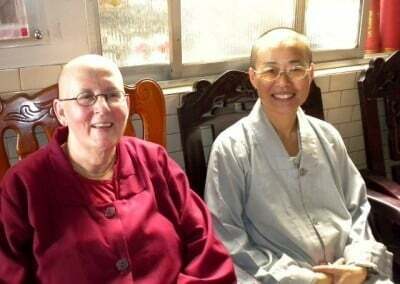 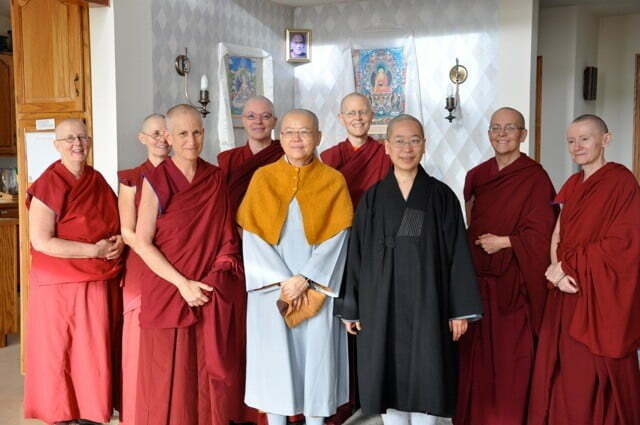 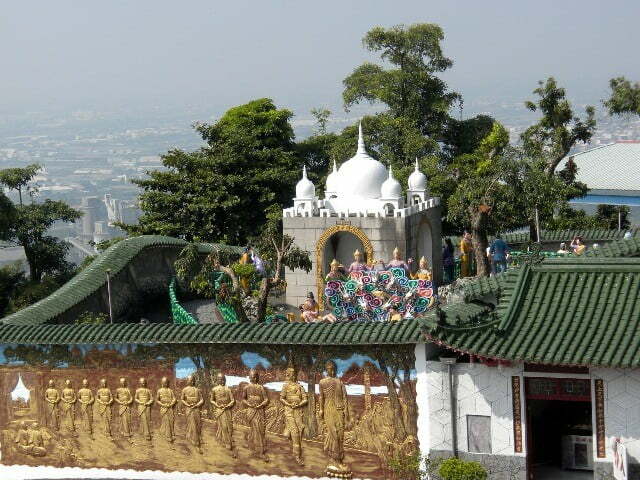 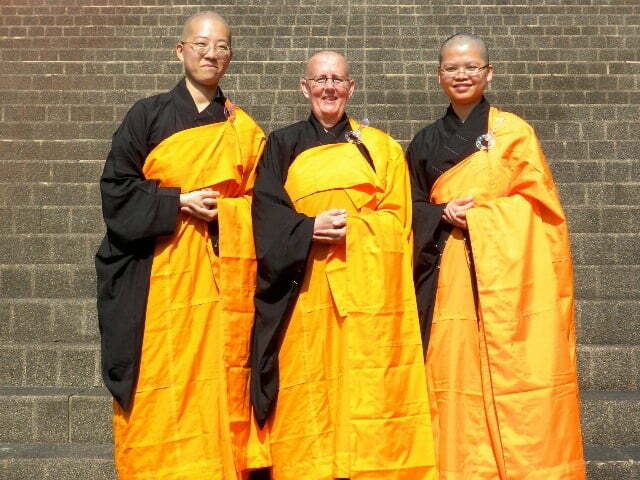 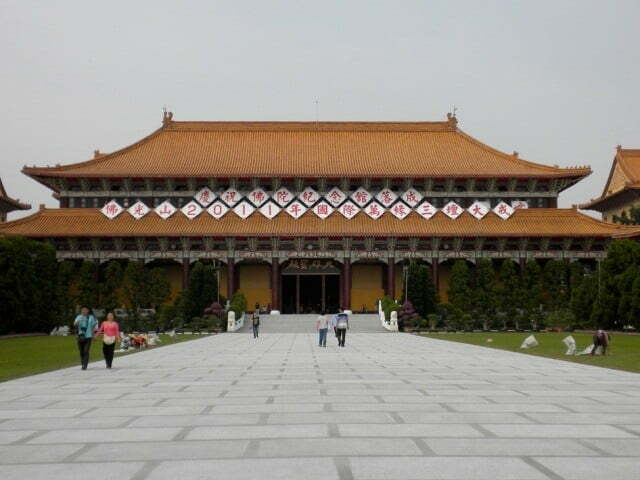 Venerables Chonyi and Jigme traveled to Fo Guang Shan temple in Kaohsiung, Taiwan to take part in the International Triple Platform Full Ordination training and ceremony, becoming the fourth and fifth fully ordained nuns (bhikshunis) at the Abbey. Along the way they stopped at Chao-Feng Temple in Gang-Shan Village to visit Venerable Tien Chang, who has helped with Abbey novice and shikshamana ordinations by translating texts and serving as a guide through for the ordination ceremony. 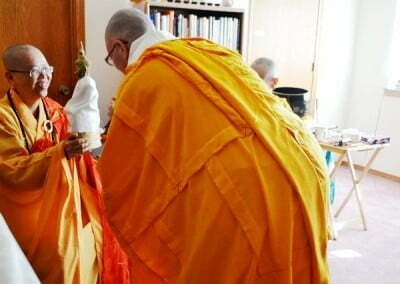 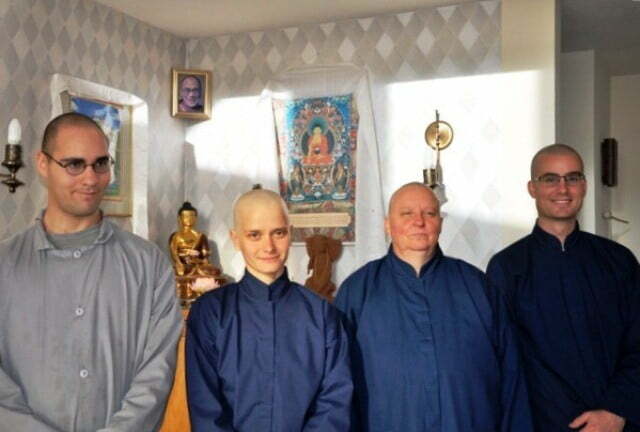 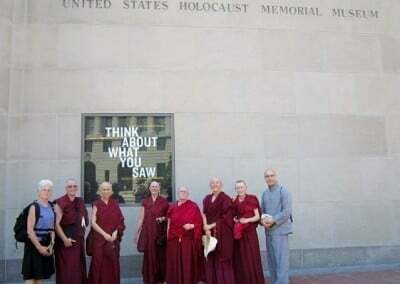 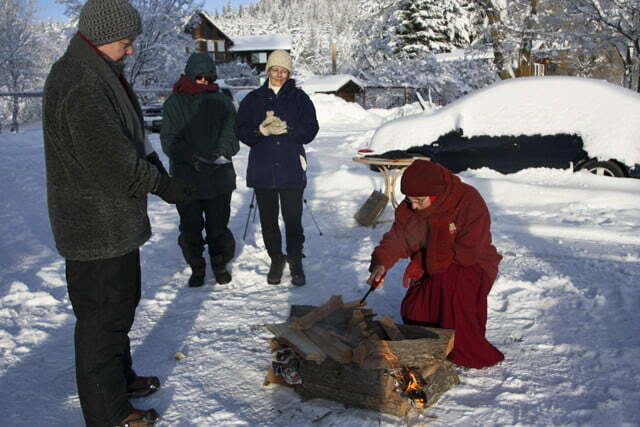 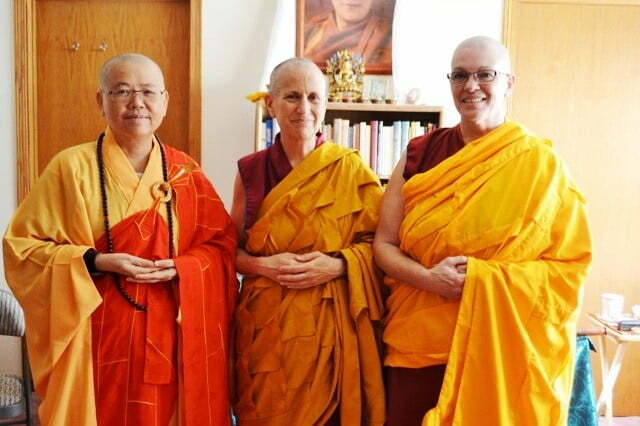 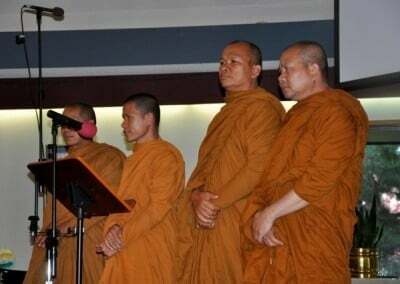 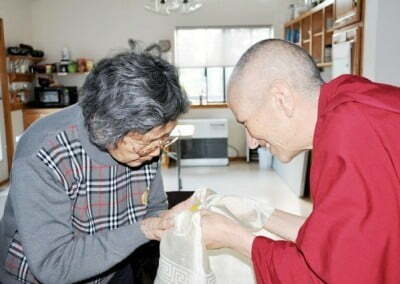 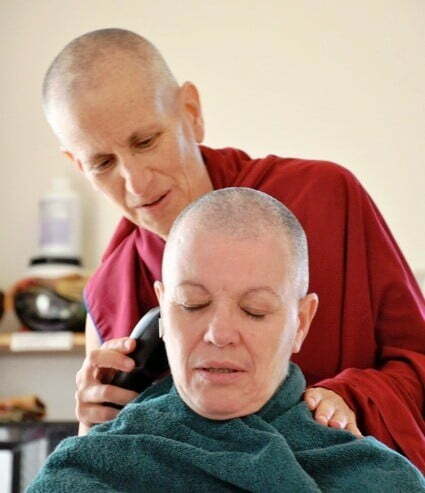 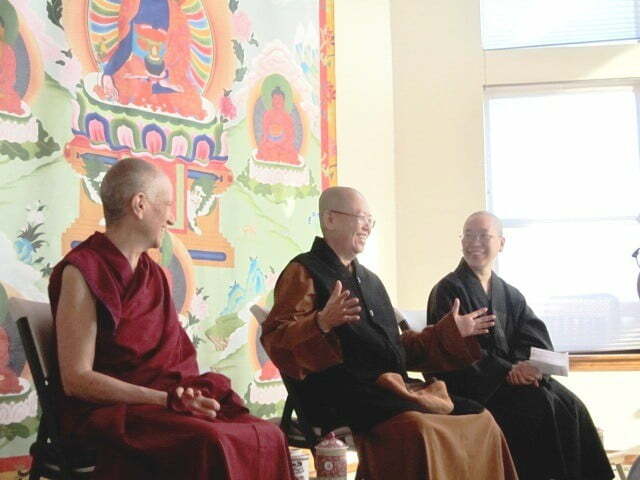 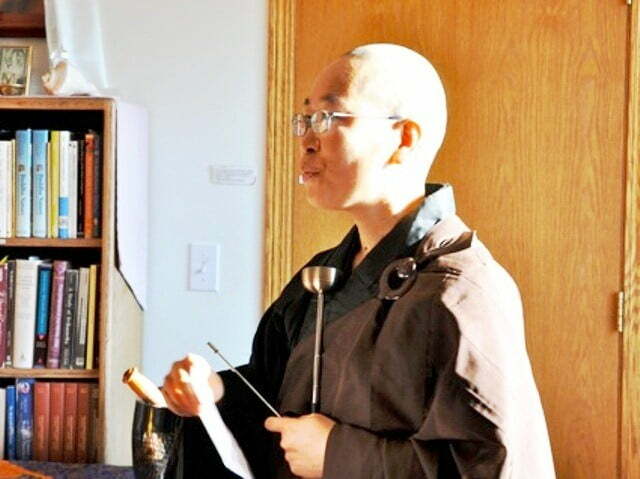 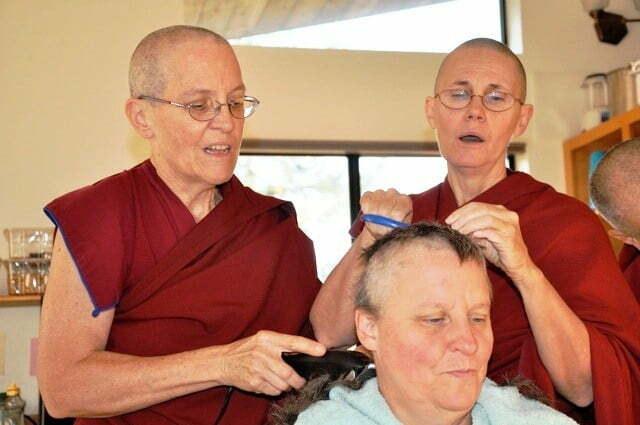 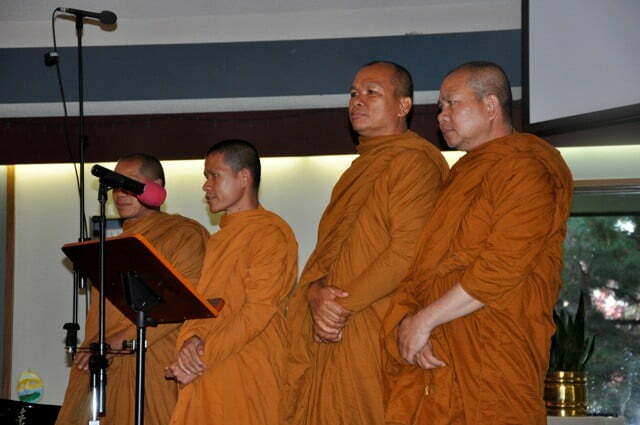 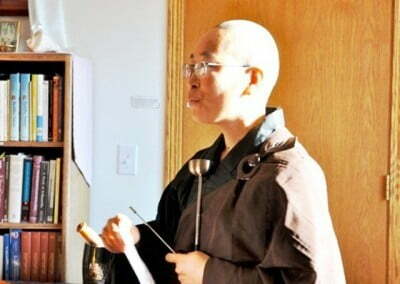 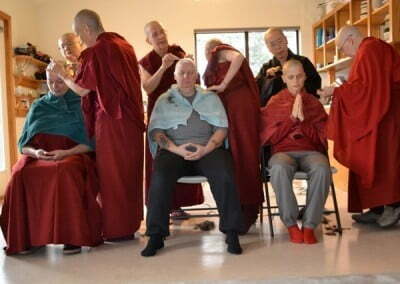 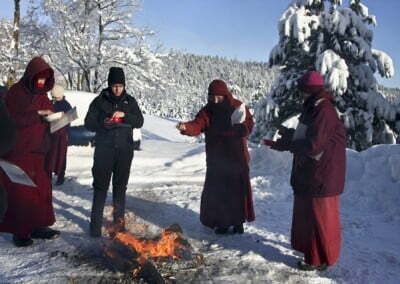 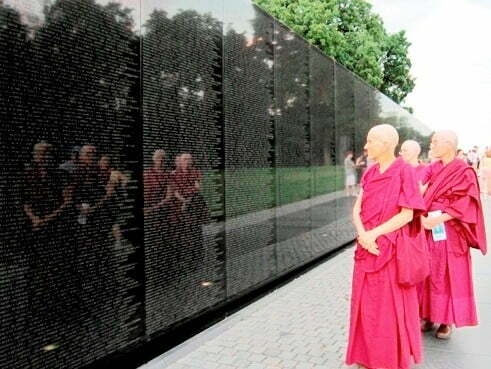 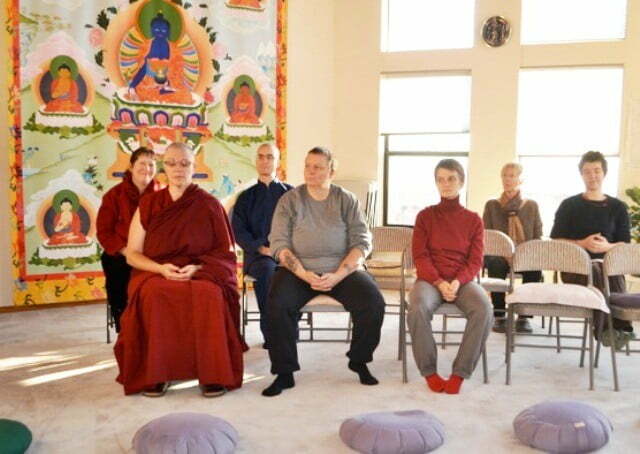 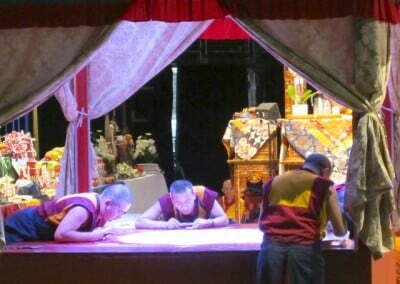 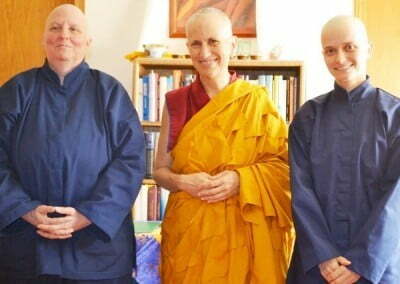 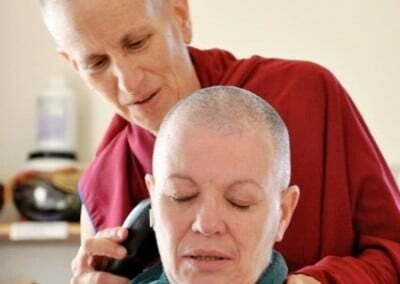 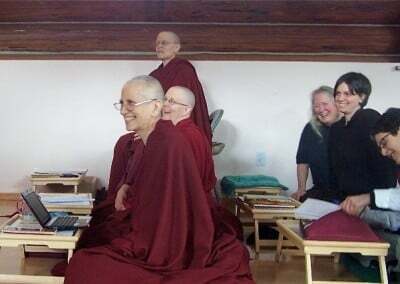 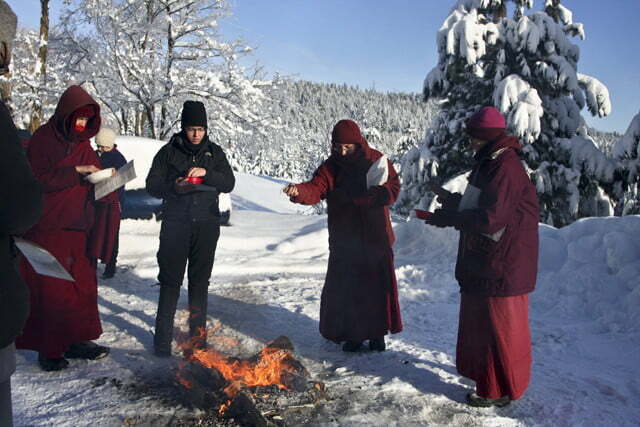 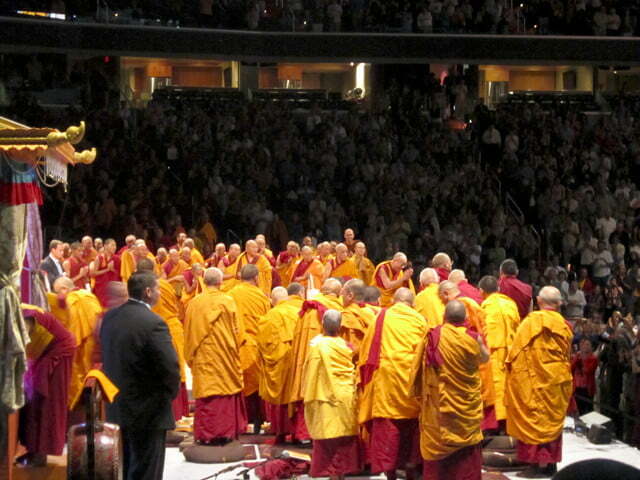 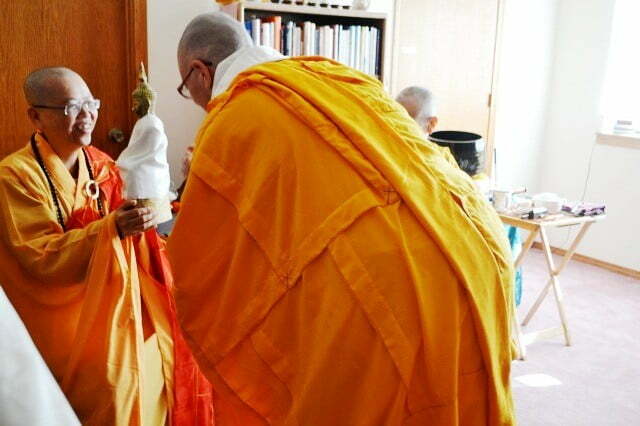 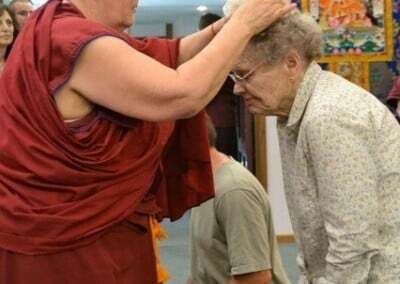 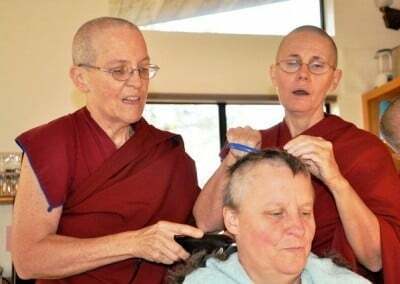 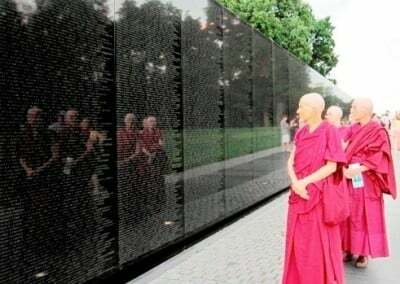 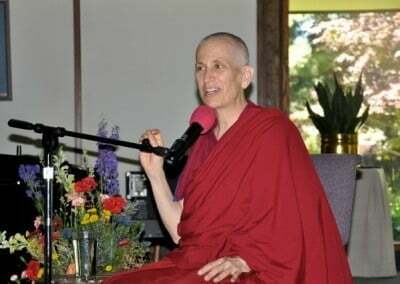 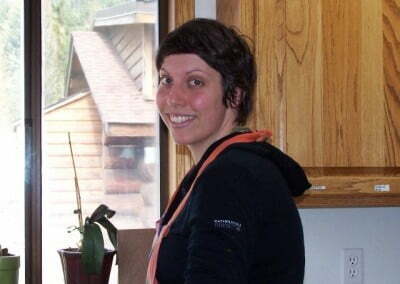 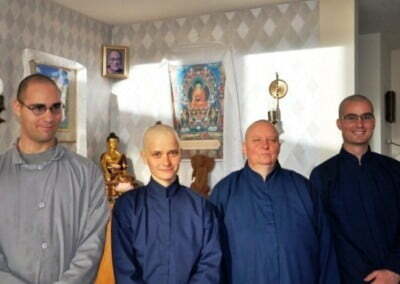 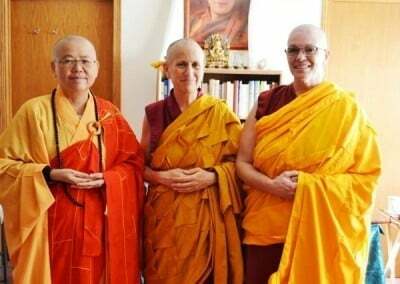 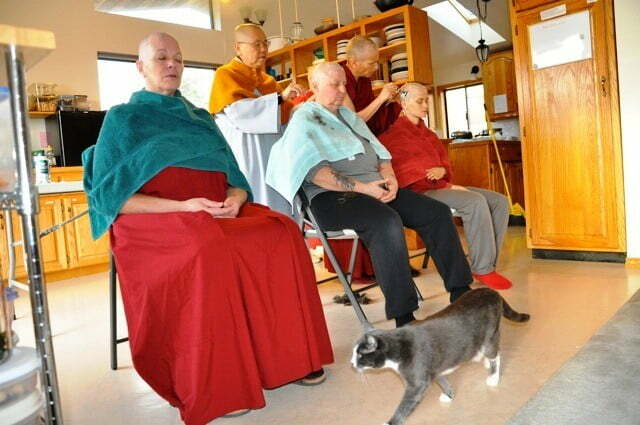 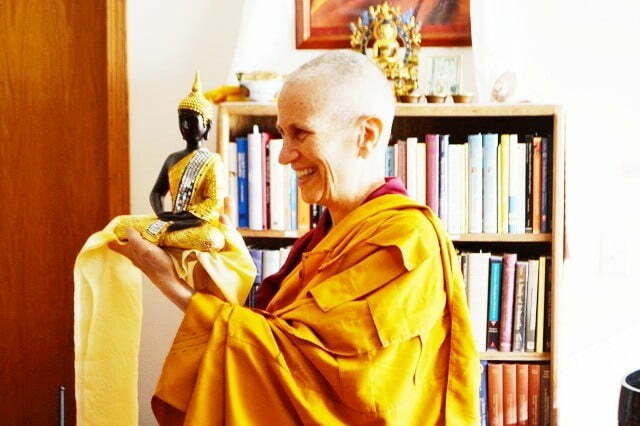 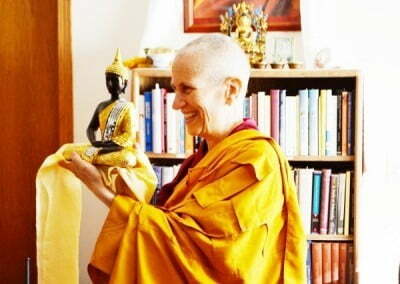 The Vinaya (the monastic ethical code) teaches that four or more fully ordained monastics comprise a sangha community that is authorized to do certain sangha activities, including the bi-monthly confession and precept ceremony, posadha. 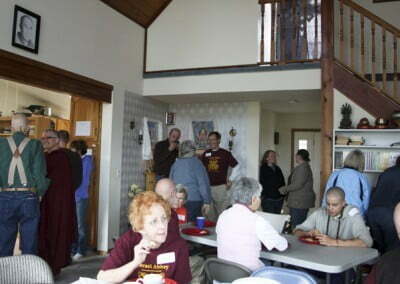 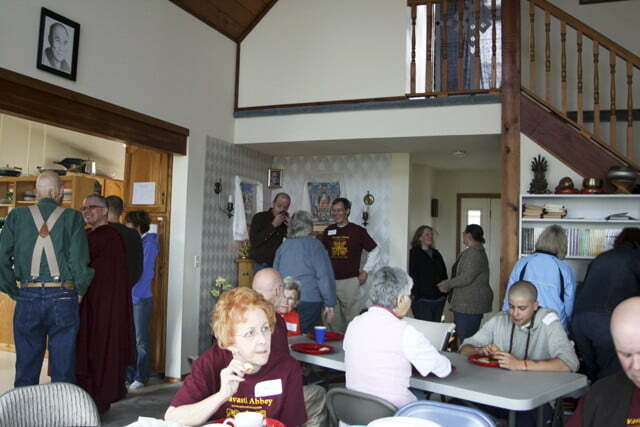 The Abbey joyfully held its first “homegrown” posadha on December 10, 2011. 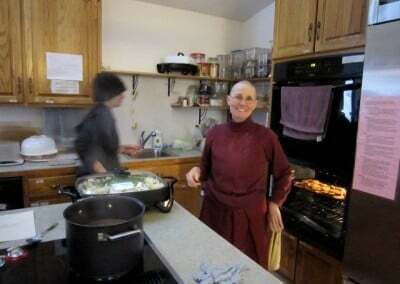 There are many joyful days at the Abbey with all the opportunities to practice the Dharma, receive teachings and live in community. 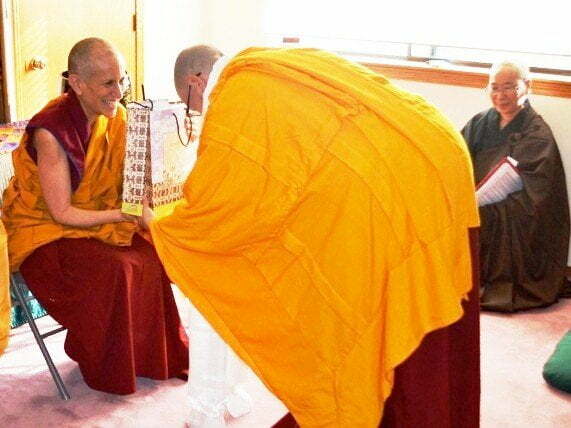 But this past week we had an added cause for rejoicing with the Shikshamana ordination of Ven. 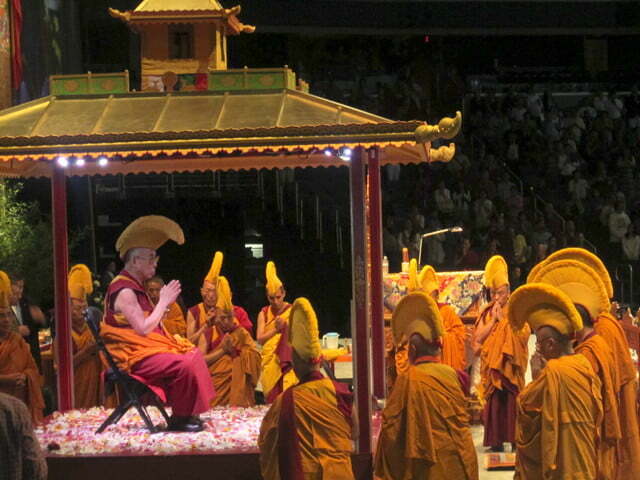 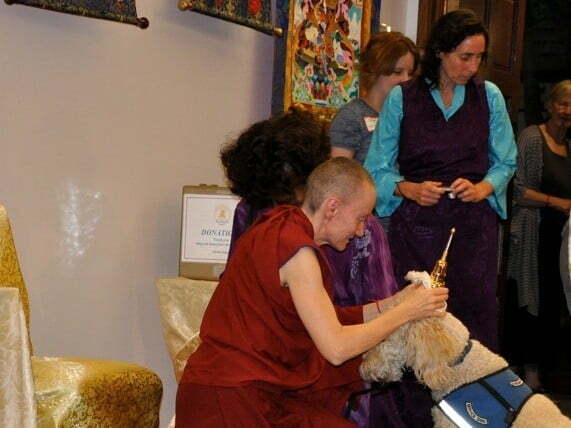 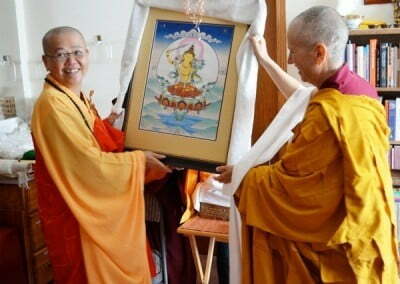 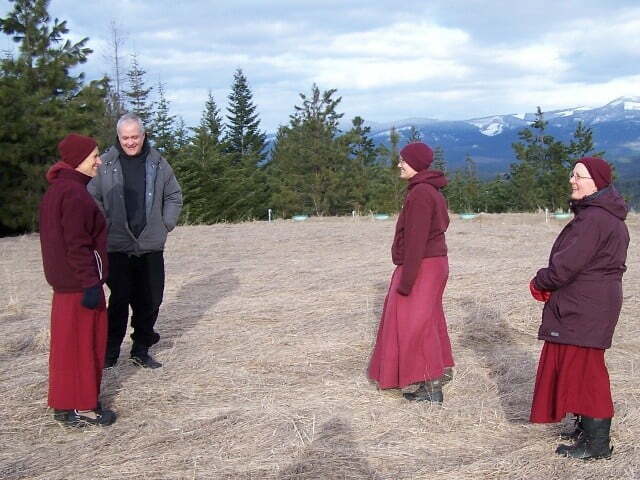 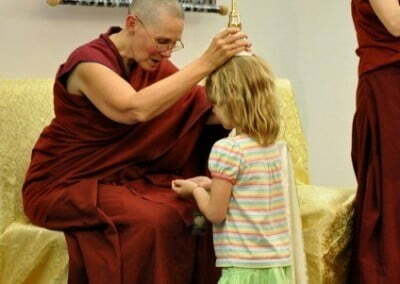 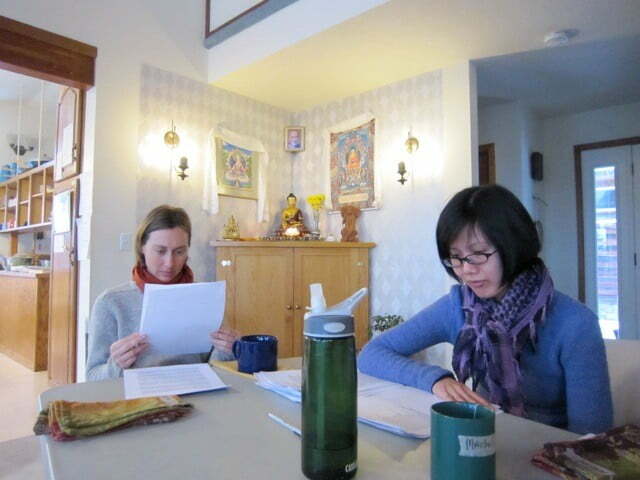 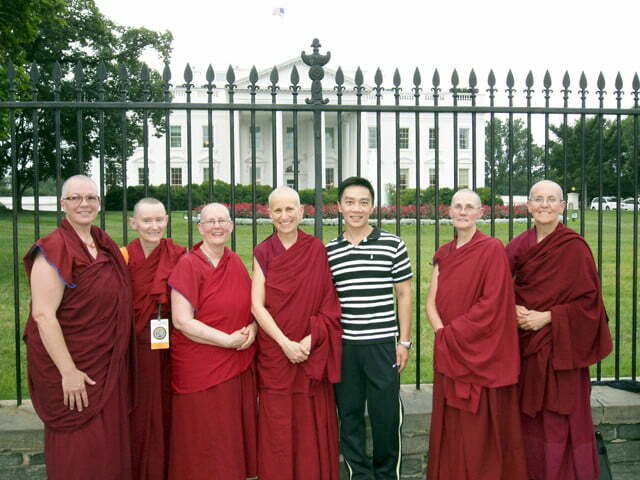 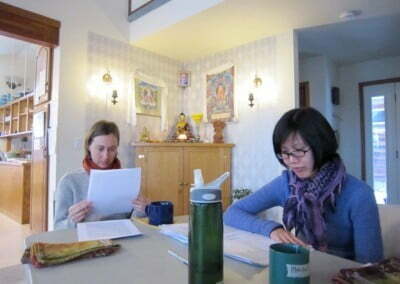 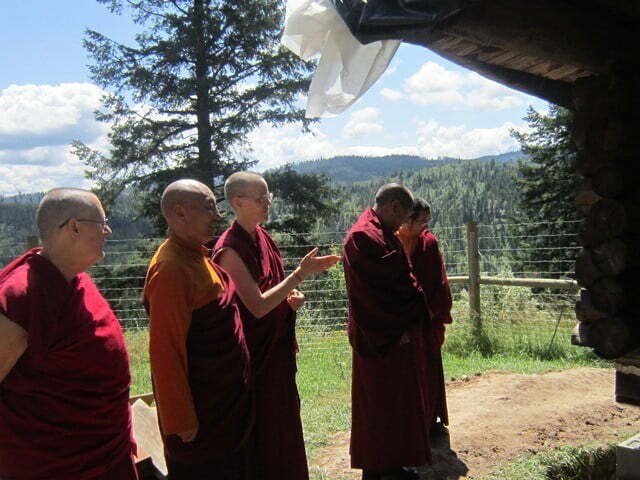 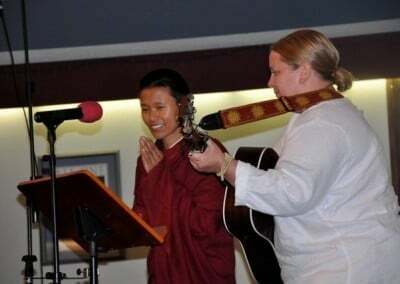 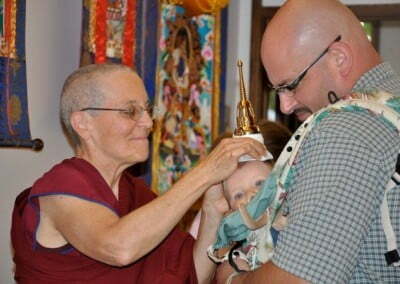 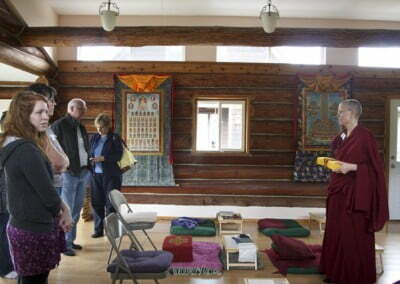 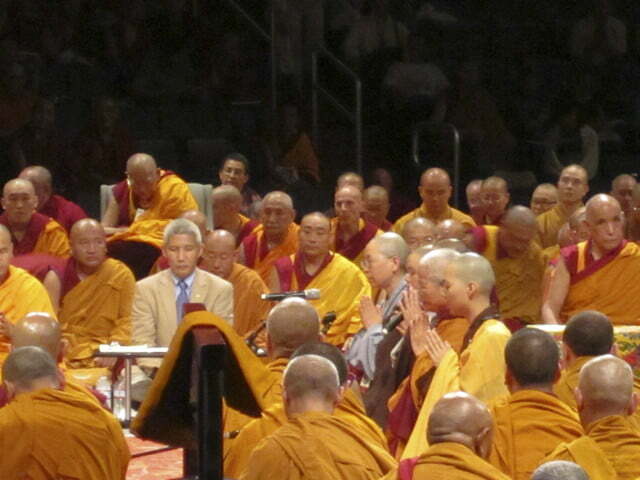 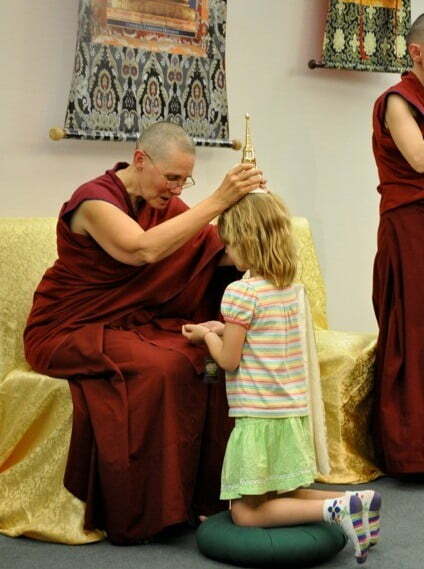 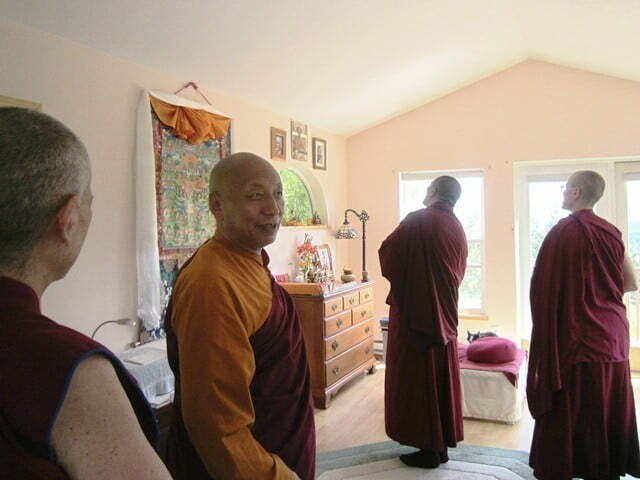 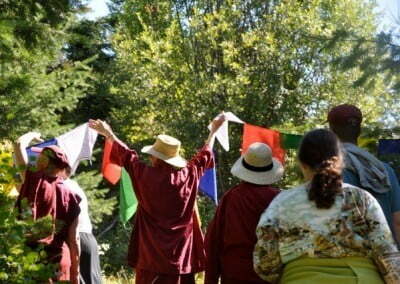 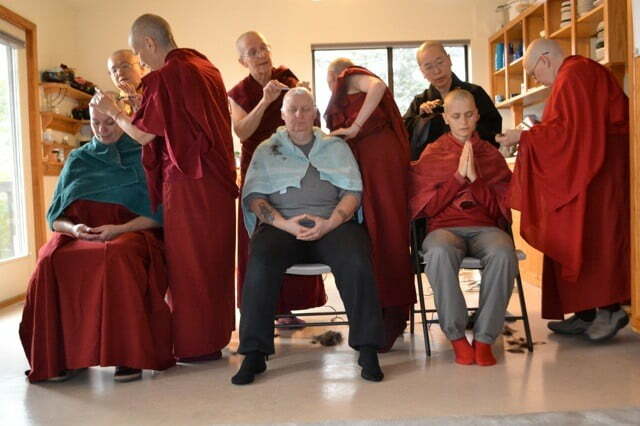 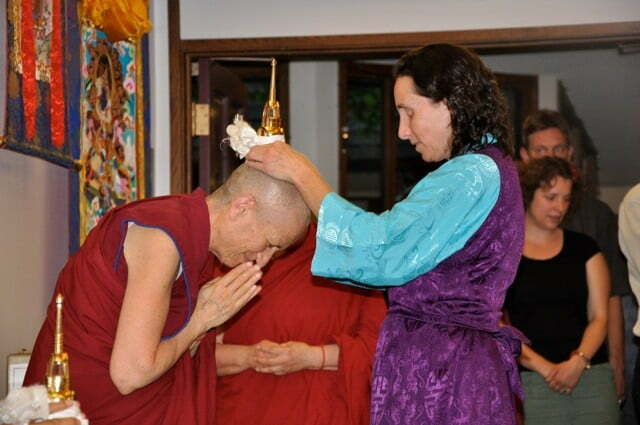 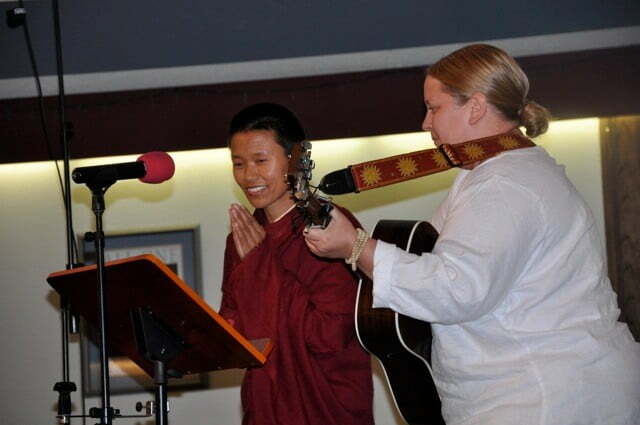 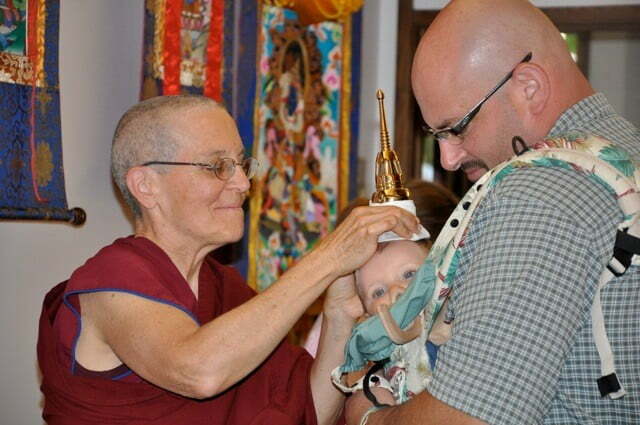 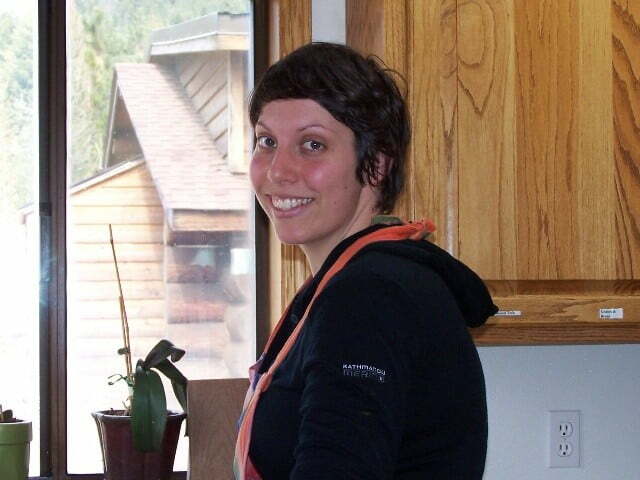 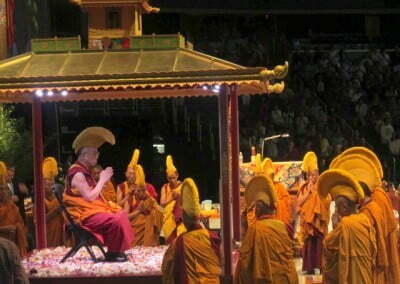 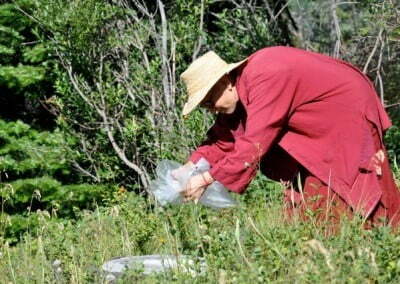 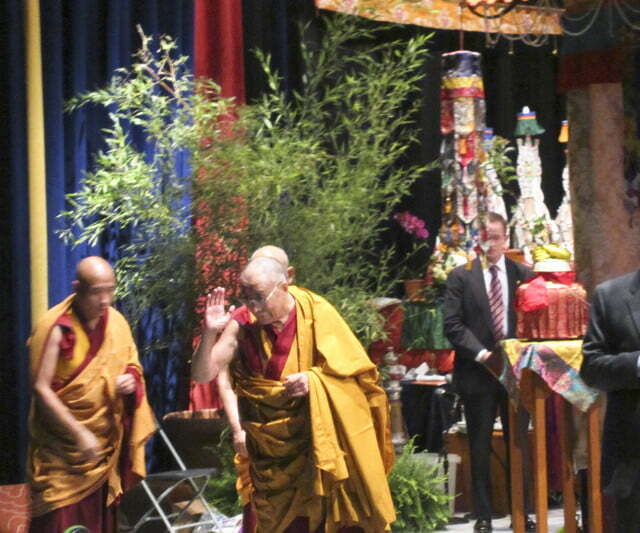 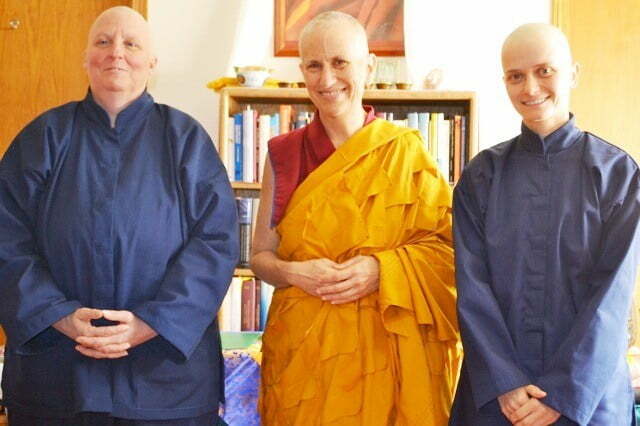 Thubten Yeshe and the giving of the 8 anagarika precepts to Dani and Terri. 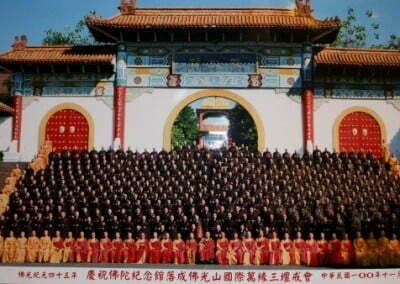 The day was beautiful, the virtue great, and merit generated was palpable. 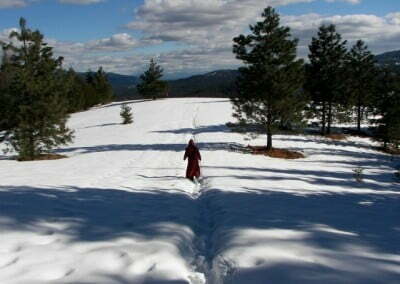 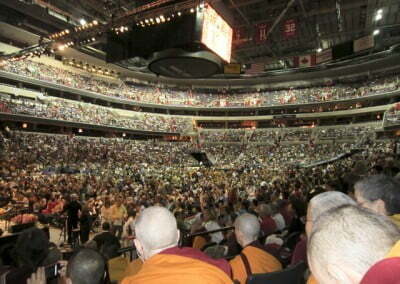 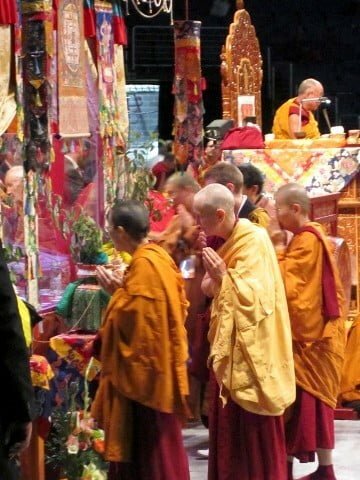 May all beings benefit from this glorious Dharma day! 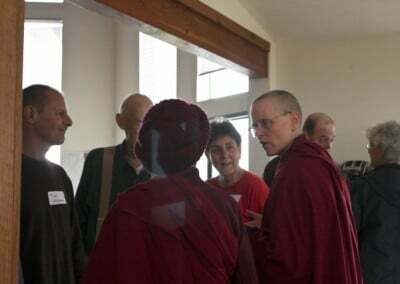 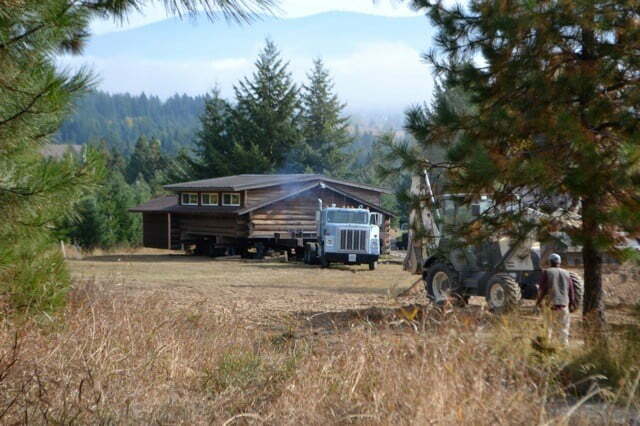 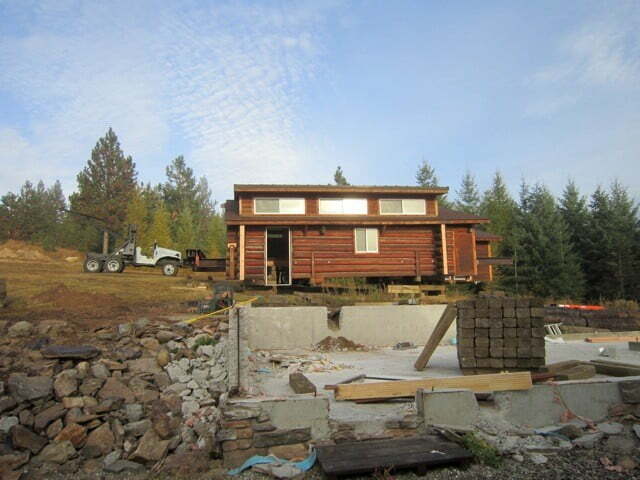 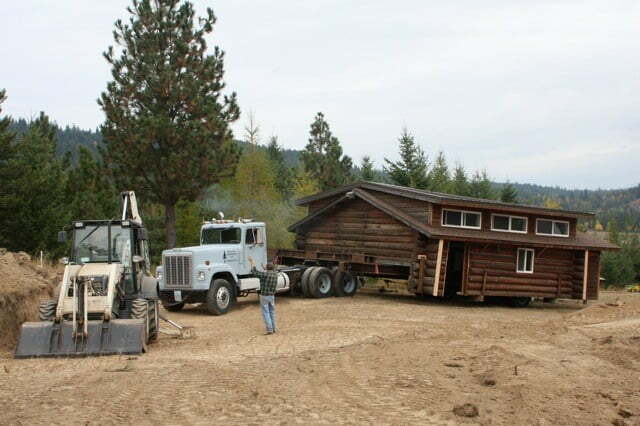 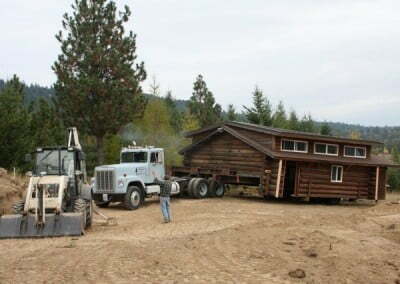 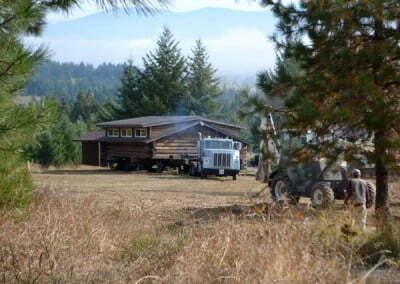 After many discussions the Abbey community decided to move its beloved meditation hall up the hill to make room for Chenrezig Hall. 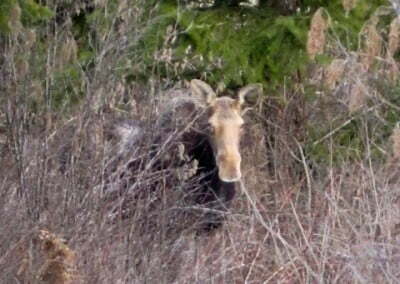 It was quite a sight to see! 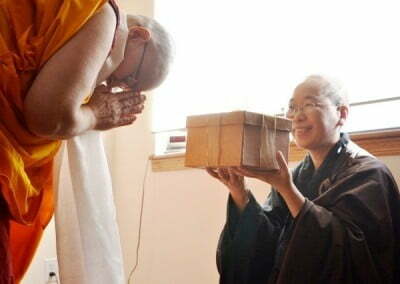 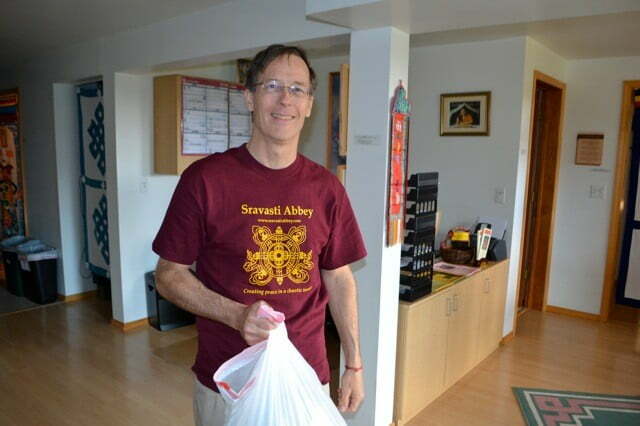 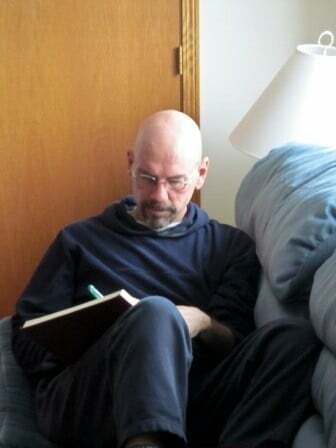 Don Wackerly, a Dharma friend incarcerated in Oklahoma who was executed last October, requested that his ashes be sent to Sravasti Abbey. 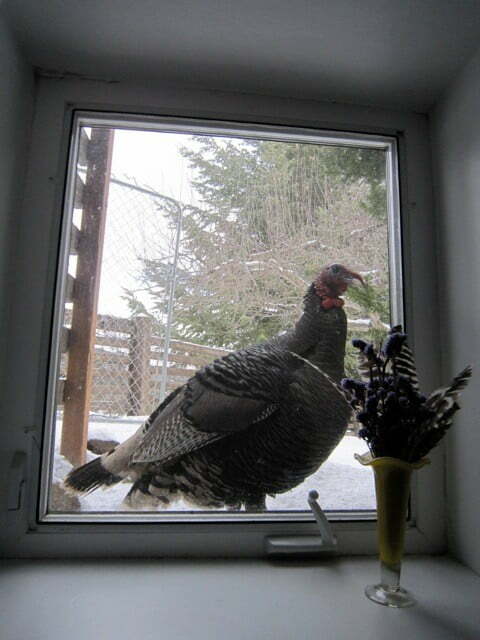 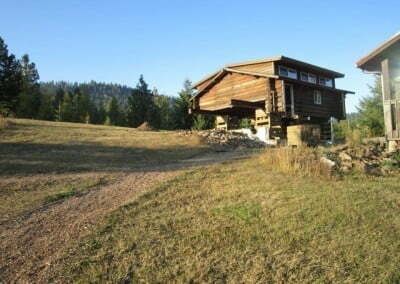 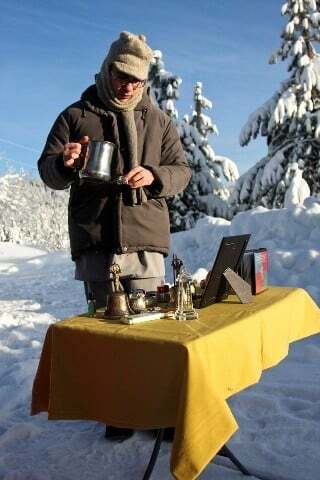 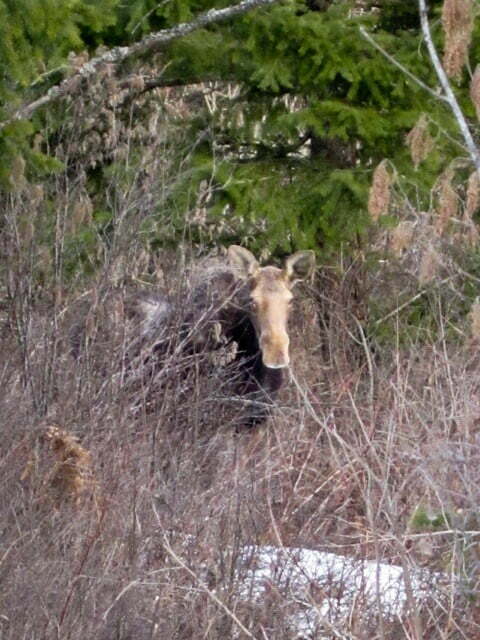 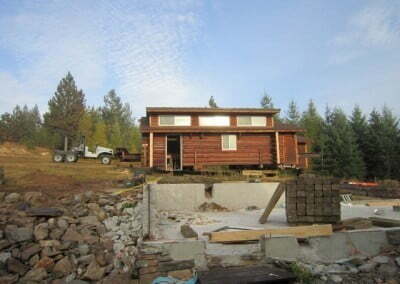 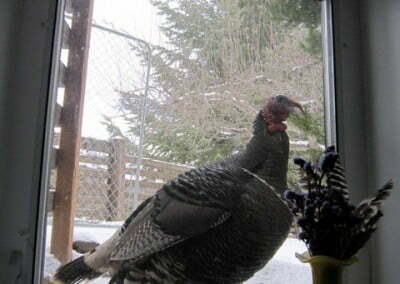 His family kindly granted his request, and they sent them to us last winter. 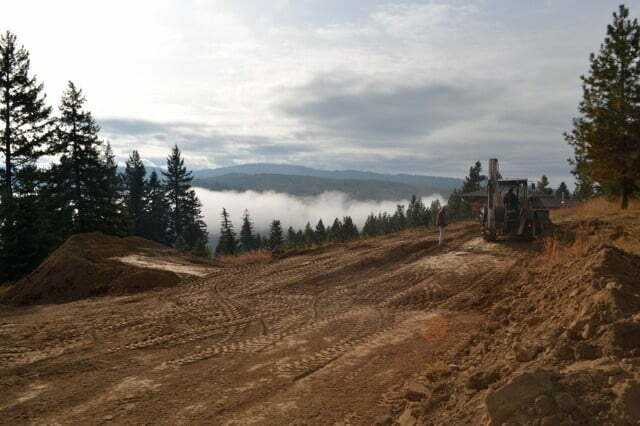 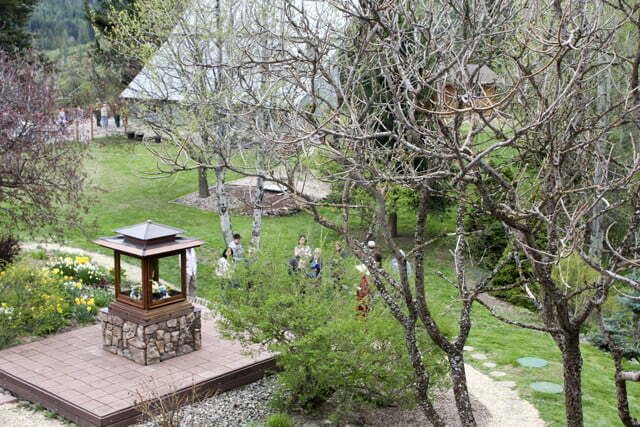 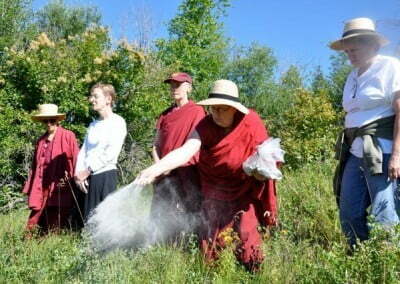 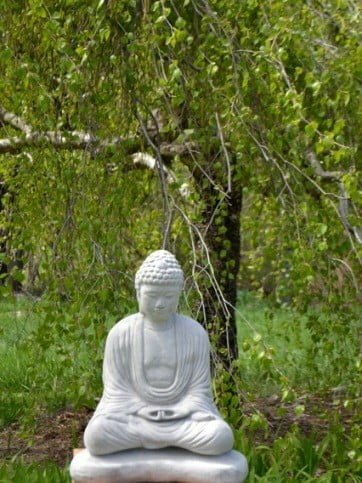 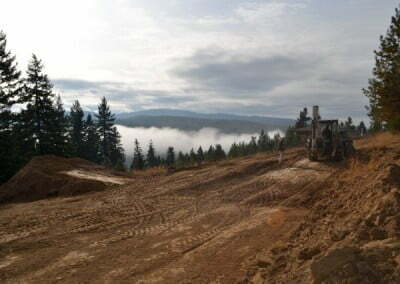 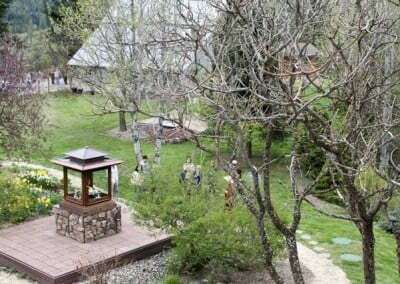 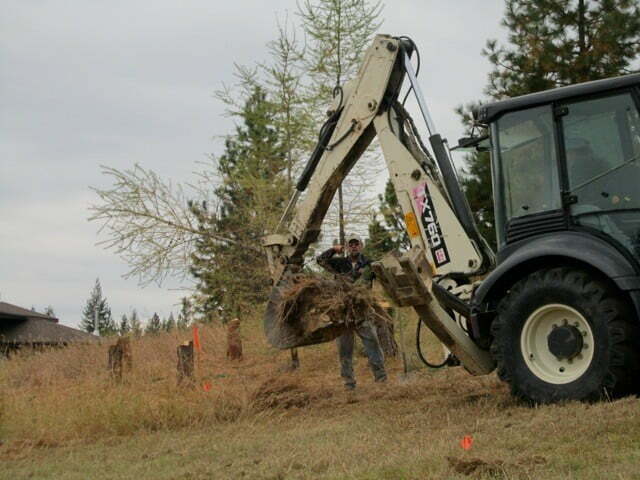 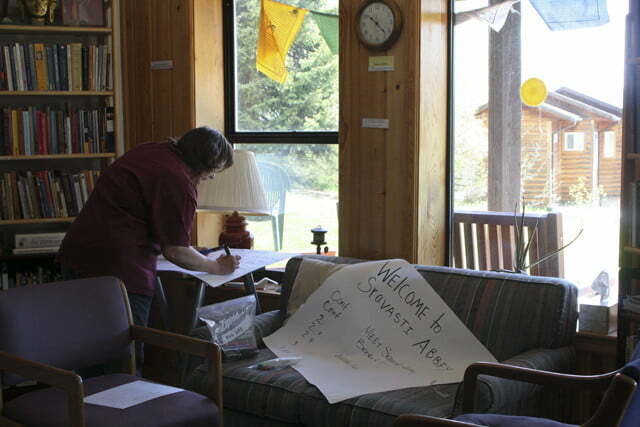 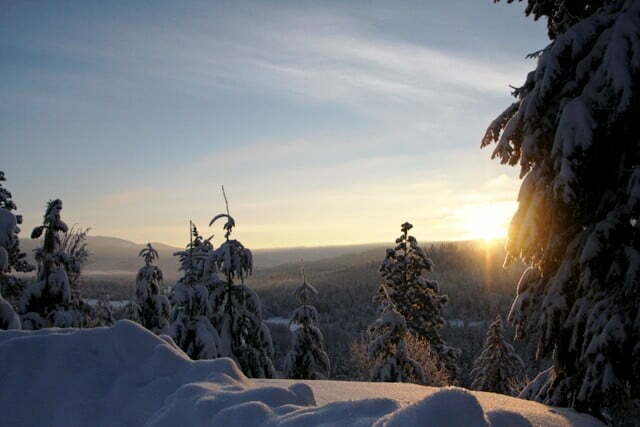 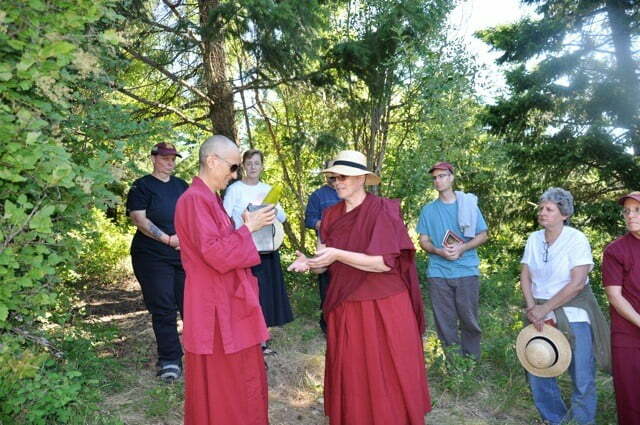 The Abbey has recently set aside an area in the forest where people’s ashes can be scattered, and we’ve called it Sukhavati, the Land of Great Bliss, after Amitabha Buddha’s pure land. 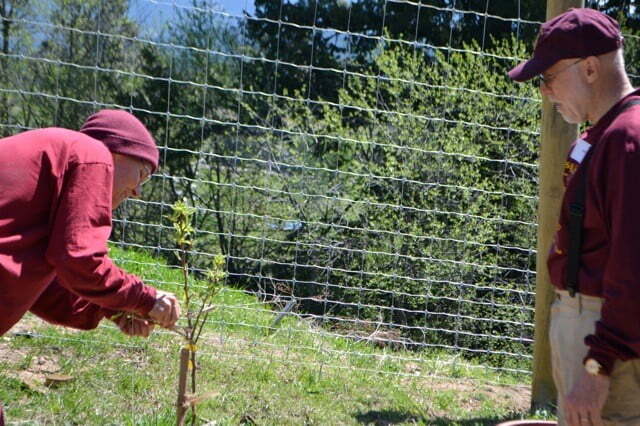 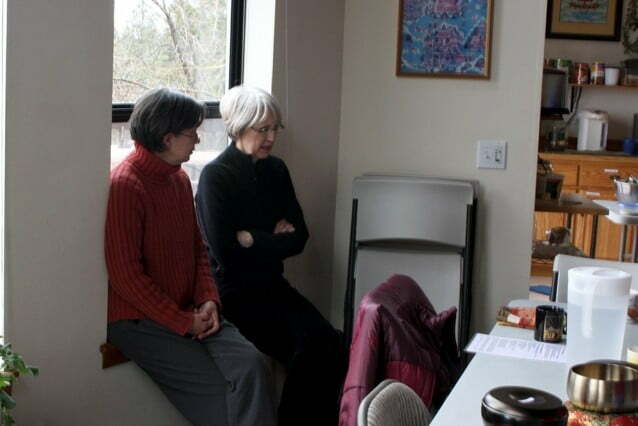 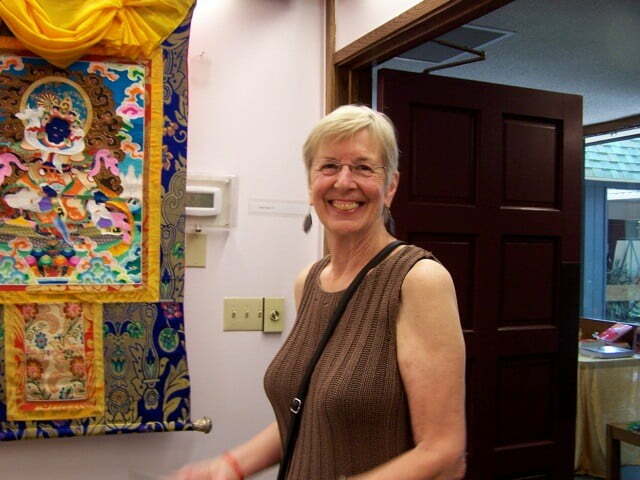 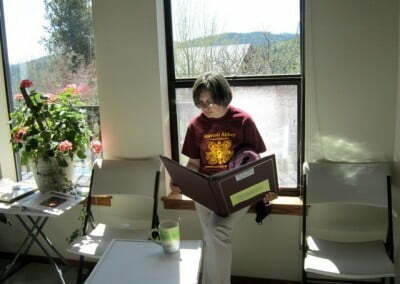 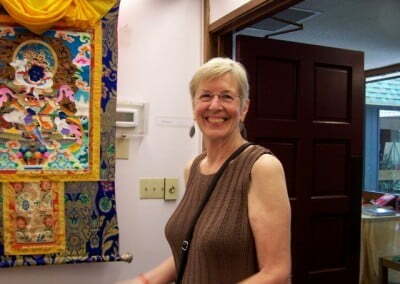 Susan Otto, Don’s attorney, visited and helped commemorate Don’s strong commitment to the Dharma in his last years and how his mind transformed during that time. 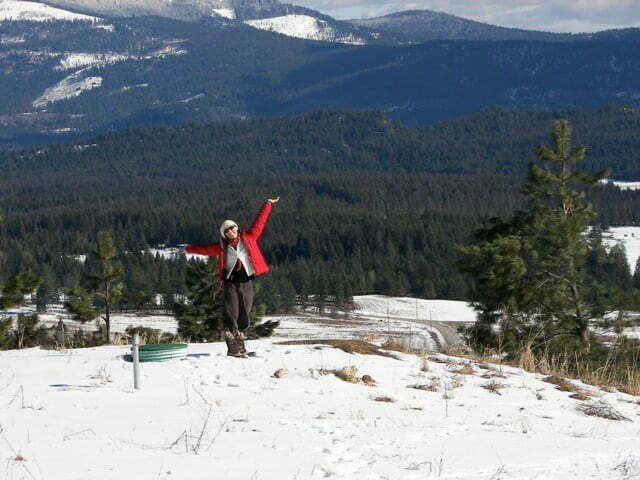 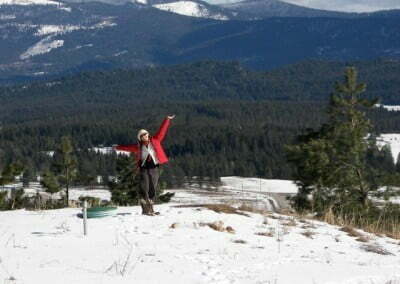 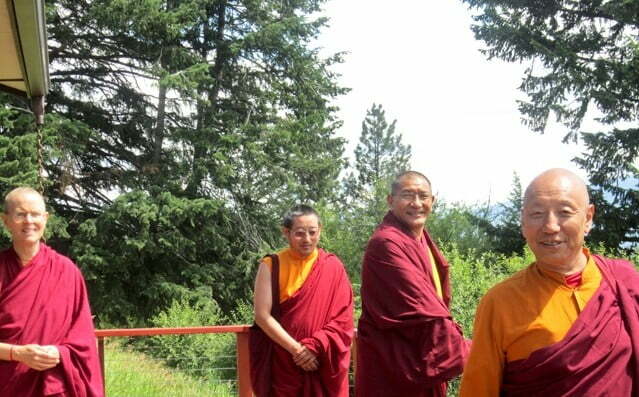 Don loved nature and so he would have loved Sukhavati, Land of Great Bliss. 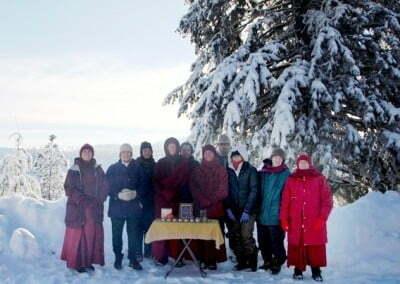 For the second time, the Abbey, together with Unity Church, sponsored the Maitreya Project Heart Shrine Relic Tour to come to Spokane. 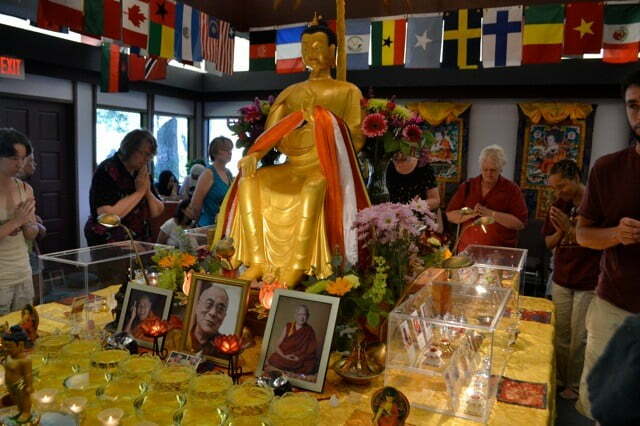 Hundreds of people from all walks of life, religious backgrounds, and ages passed quietly around the room where the relics of great Buddhist masters were displayed. 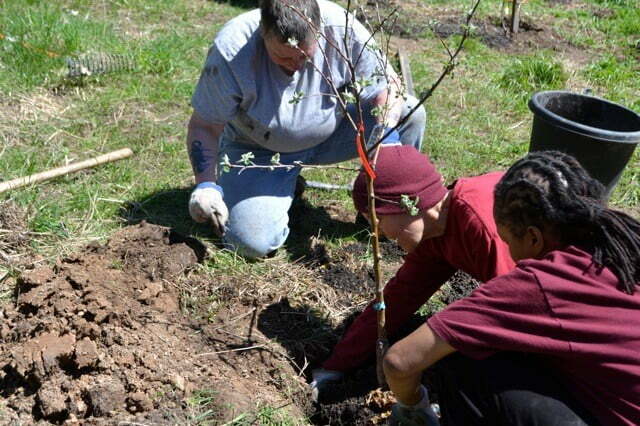 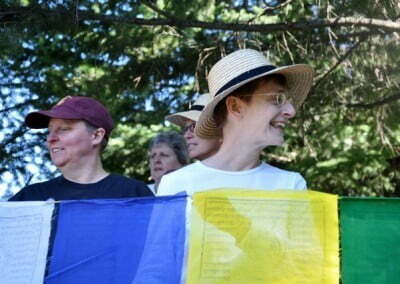 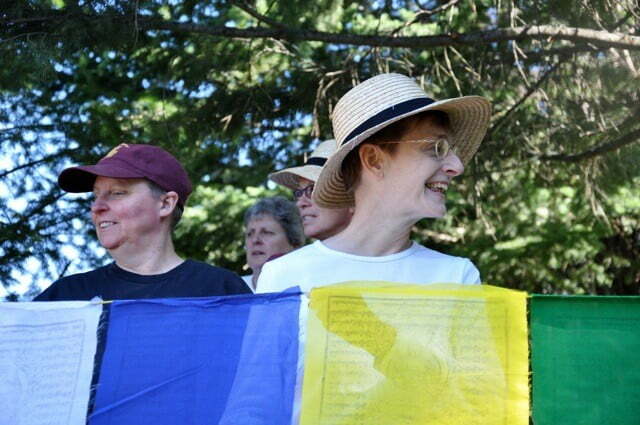 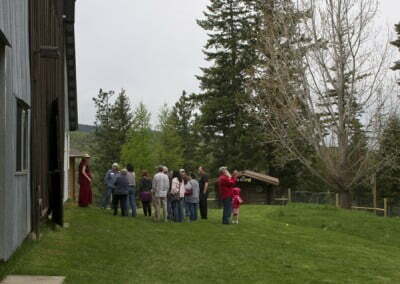 With the support of dozens of volunteers and the interfaith community of Spokane, the event expressed an openness and inclusivity that is sometimes rare to find. 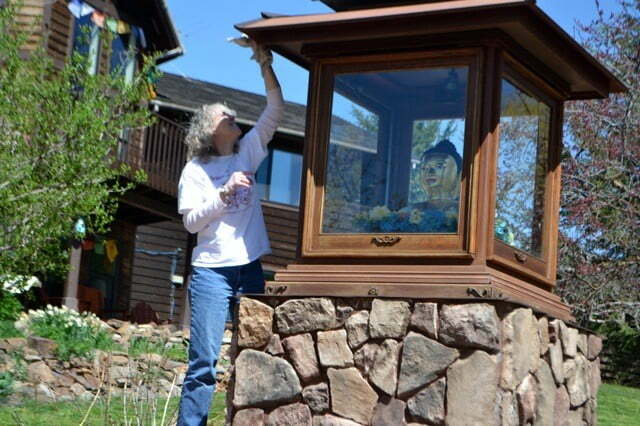 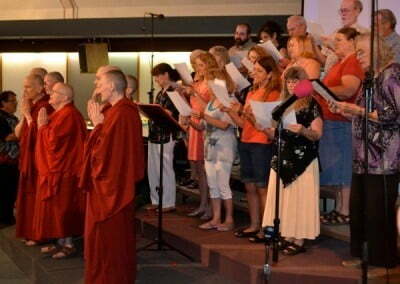 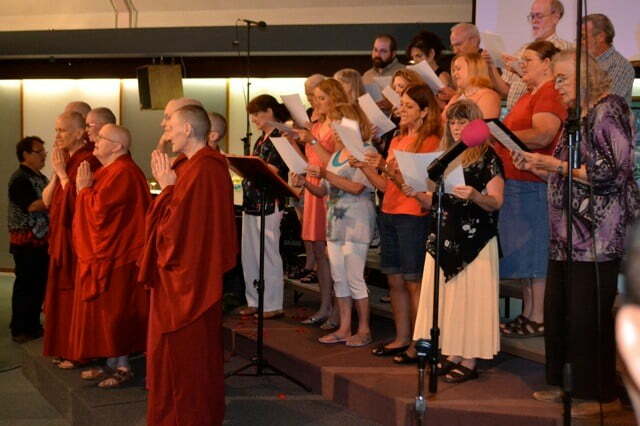 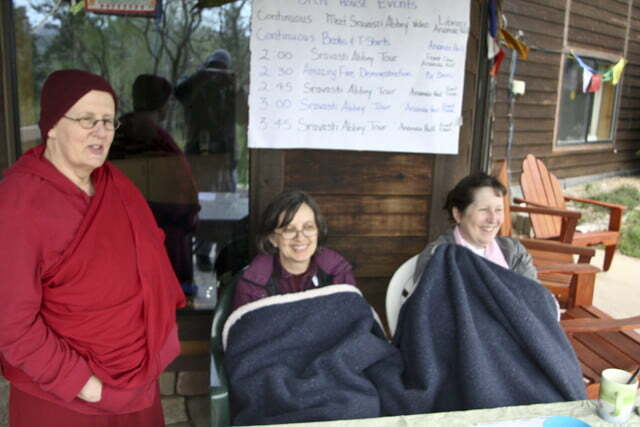 Workshops on compassion and forgiveness, storytelling about the Buddha’s life, and chanting from different spiritual traditions gave the weekend a joyful air. 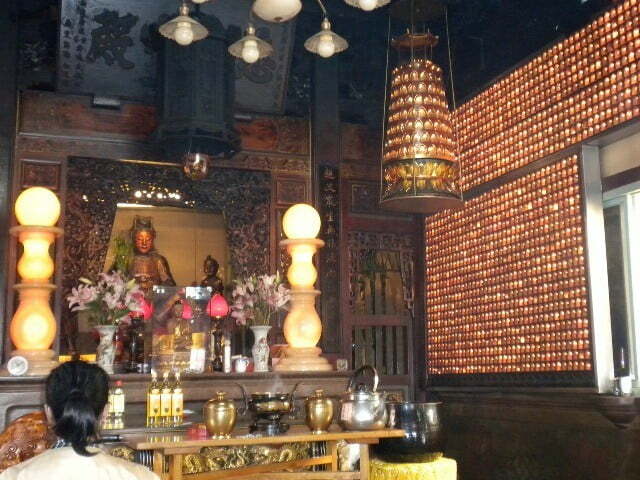 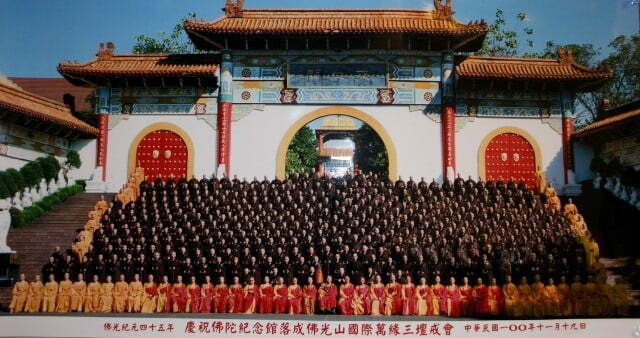 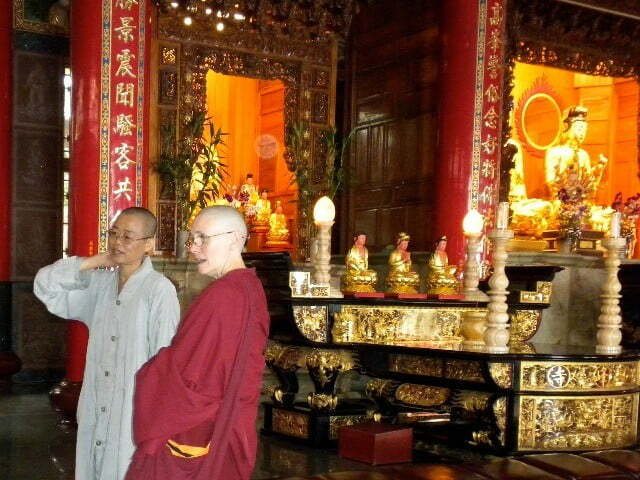 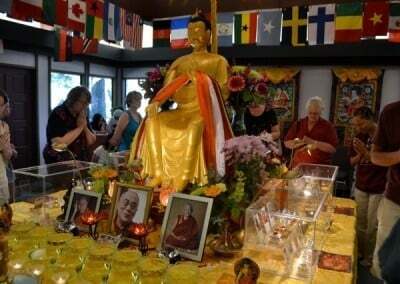 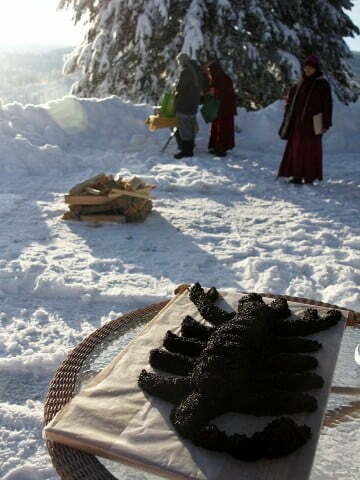 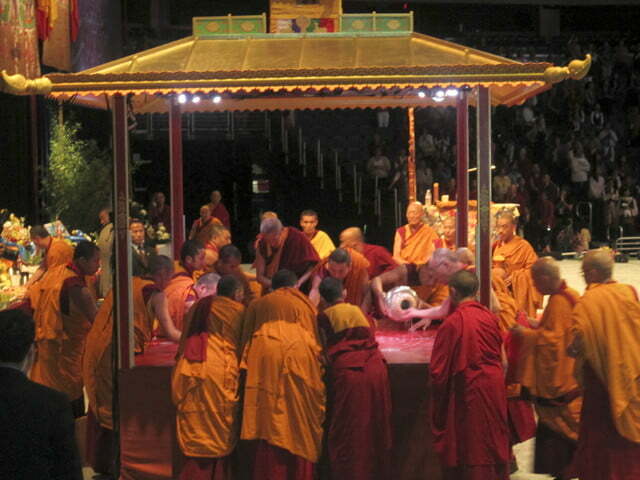 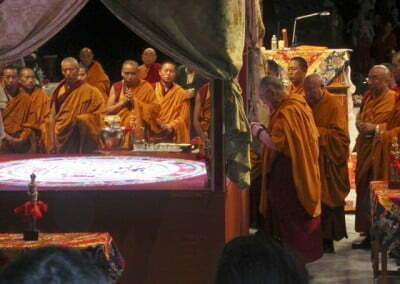 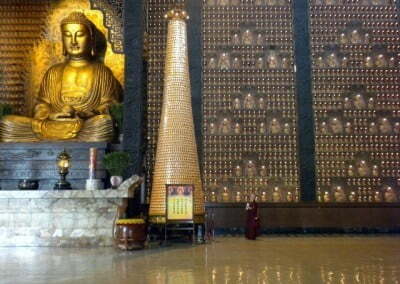 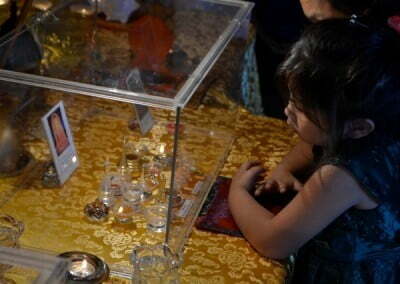 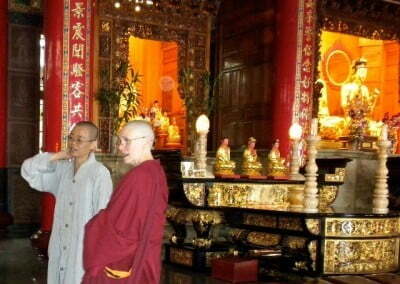 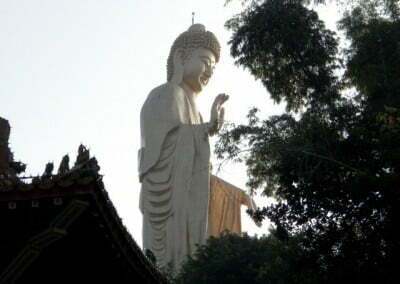 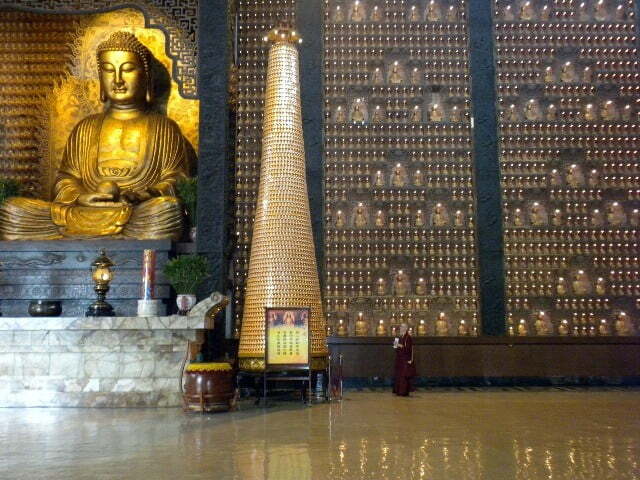 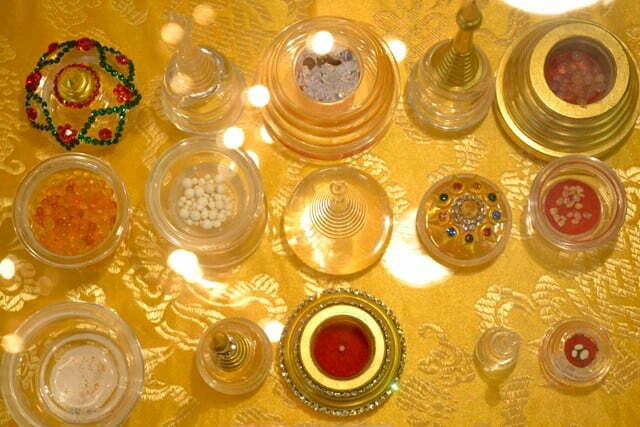 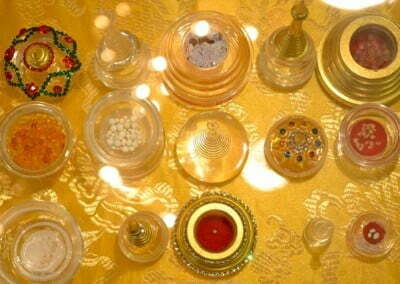 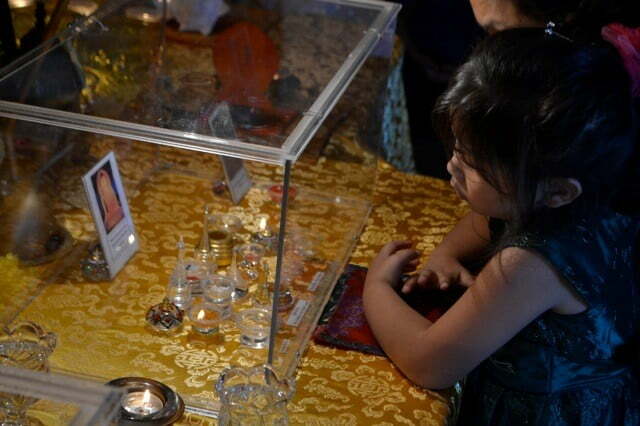 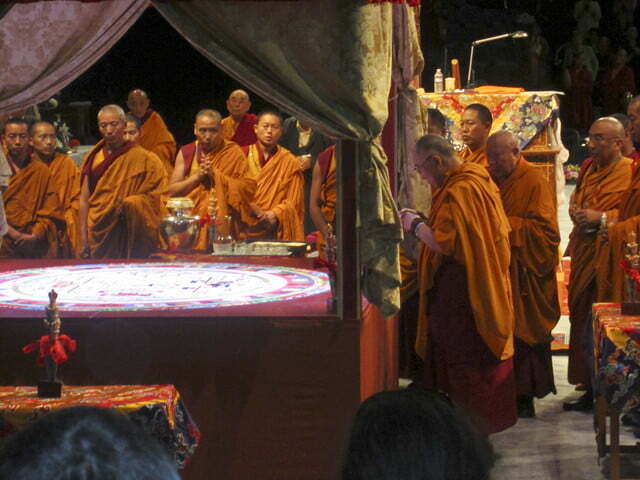 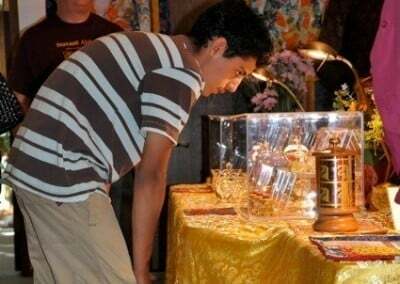 May all who came to view and be blessed by the relics be healthy and happy, and may all beings quickly become Buddhas. 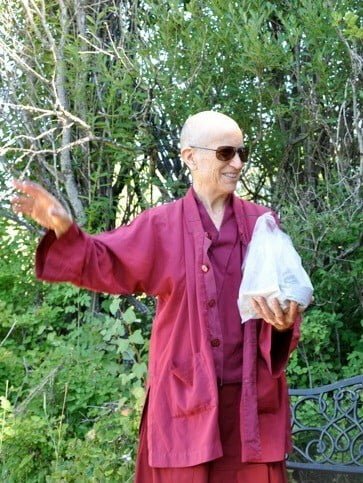 One of the Nyingma traditions’s most highly respected and well loved throne holders, Katok Getse Rinpoche, visited the Abbey this month. 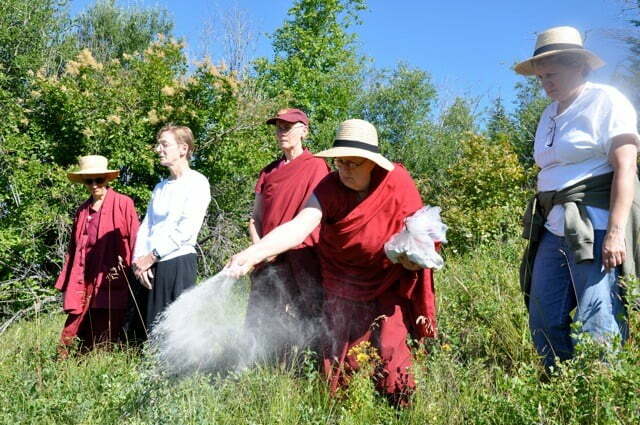 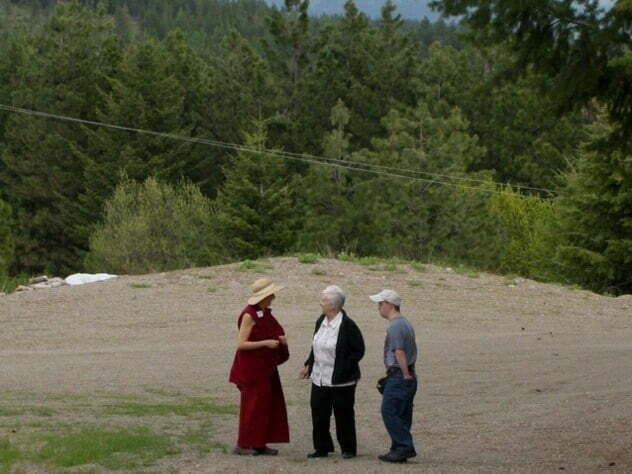 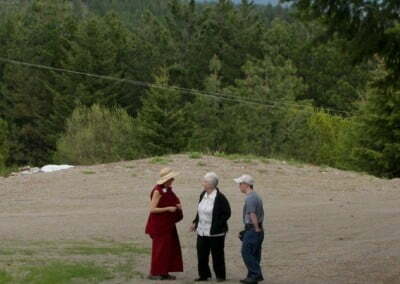 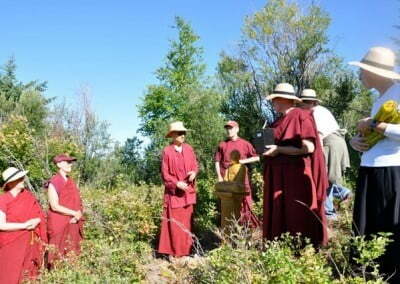 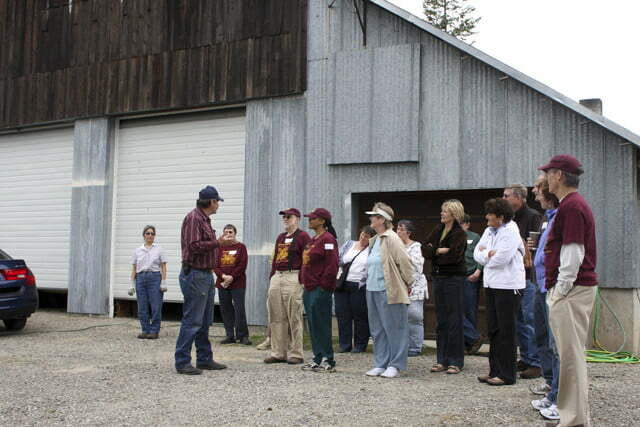 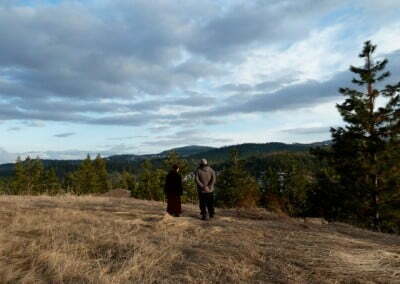 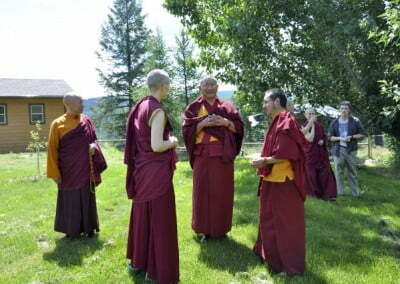 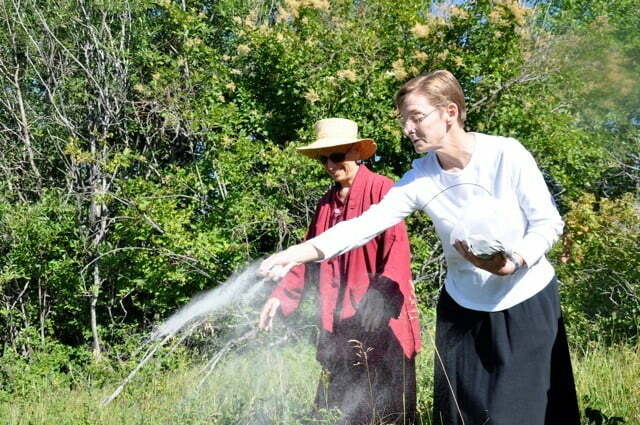 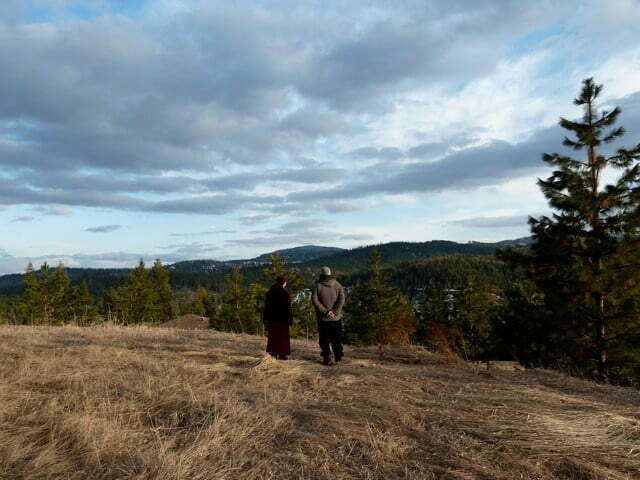 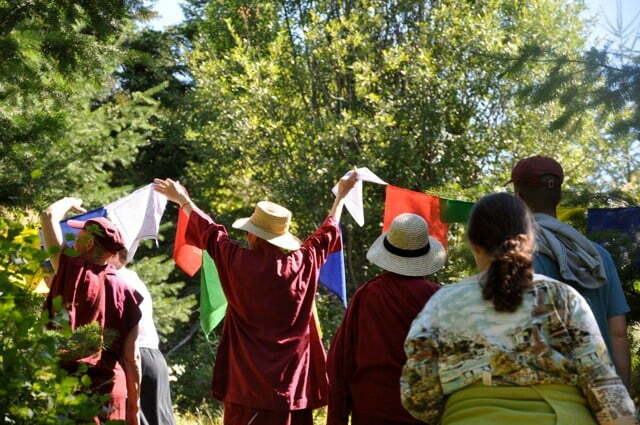 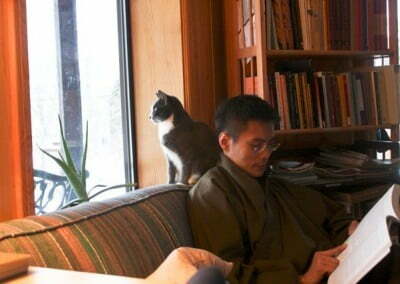 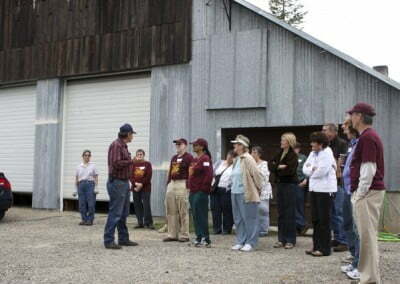 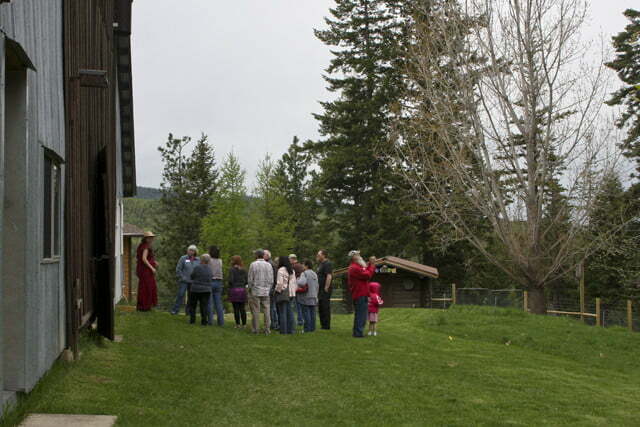 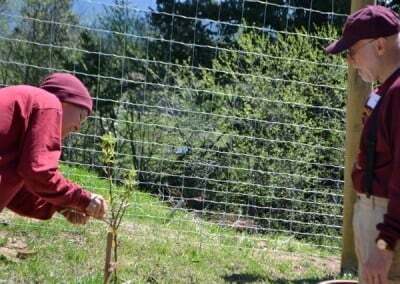 Along with Lingtrul Rinpoche and Lama Lekshe, Rinpoche took great interest in the Abbey grounds, buildings and community life as Venerable Tarpa and the rest of the community toured the property with them. 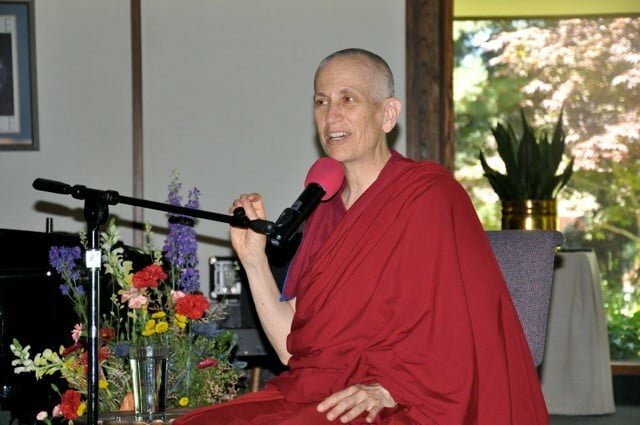 Lama Lekshe kindly translated for Rinpoche during lunch when he reminded us of how fortunate we are to have such conducive circumstances for Dharma practice and encouraged us to take full advantage of the opportunity. 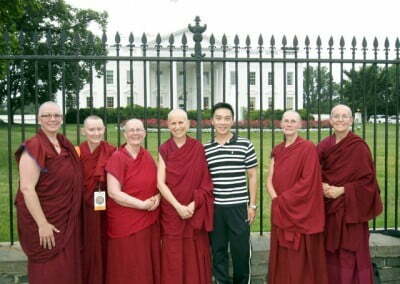 It was a great honor to have him with us, and we invited him to return in the future. 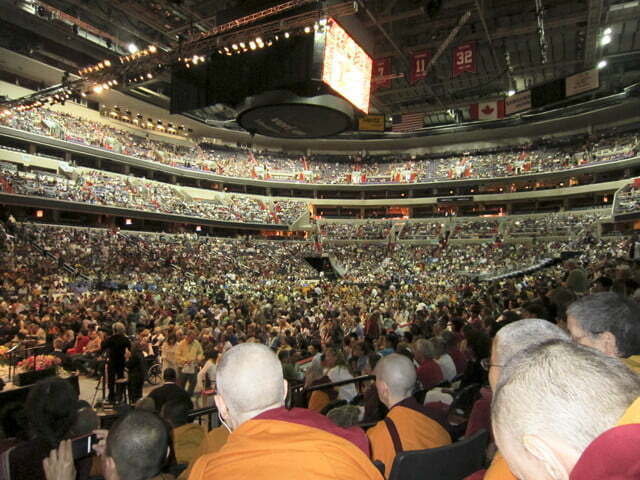 12,000-15,000 people were together to receive the Kalachakra empowerment from the greatest spiritual master in our world today, His Holiness, the Dalai Lama. 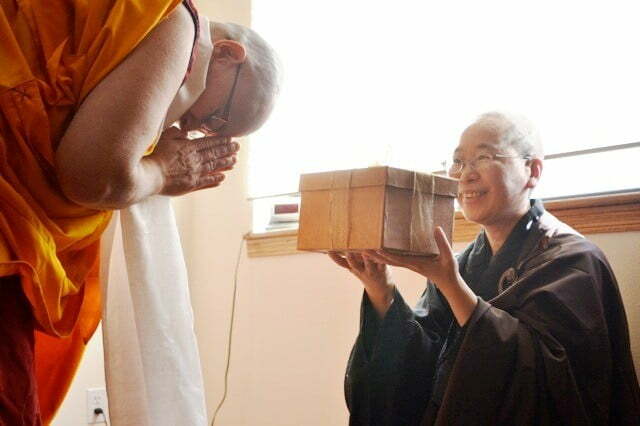 With pristine wisdom and tireless compassion, His Holiness enthusiastically encouraged all of us to practice with effort and joy and to live our lives in an ethical way. The kindness of so many people made it possible for the entire Abbey resident community to attend the teachings and initiation, and we are deeply grateful to you. 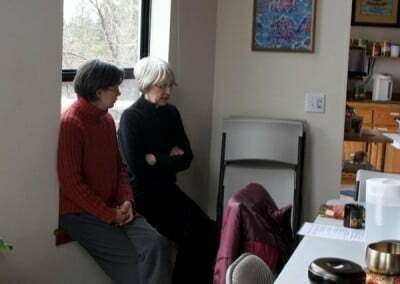 The Abbey’s annual Open House is a chance to connect with our neighbors, service providers, and old and new friends in an informal way. 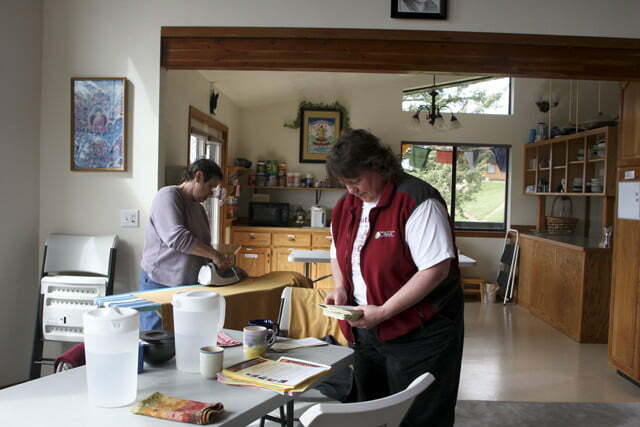 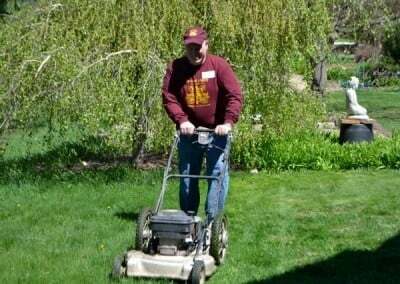 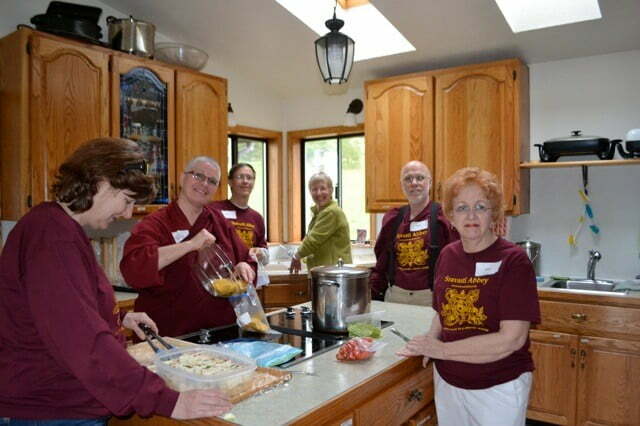 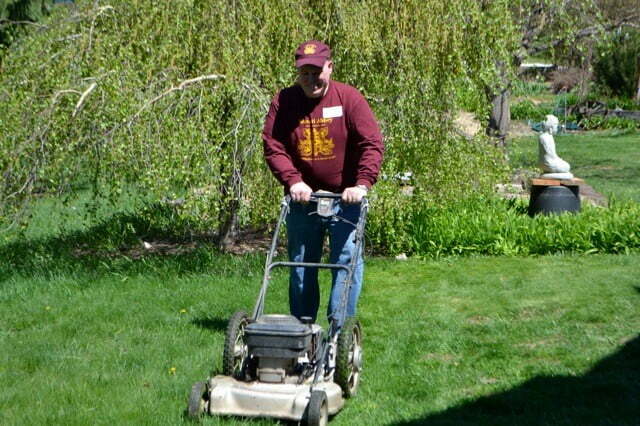 About 15 volunteers came early to finish cleaning, move furniture, prepare snacks, and join the community to host the event, showing their sense of belonging and of being an integral part of the extended Abbey community. 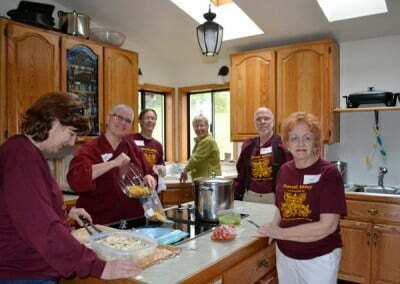 It was a wonderful day of sharing that went from a sunny morning throughout a rainy afternoon. 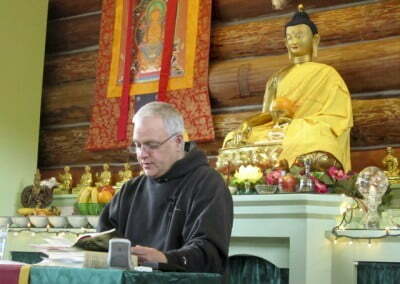 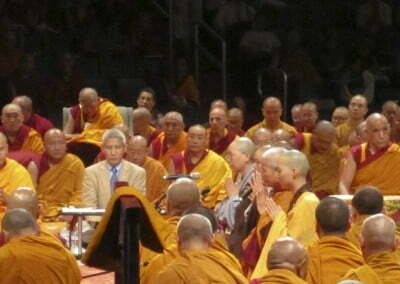 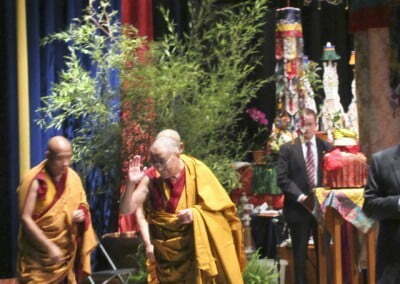 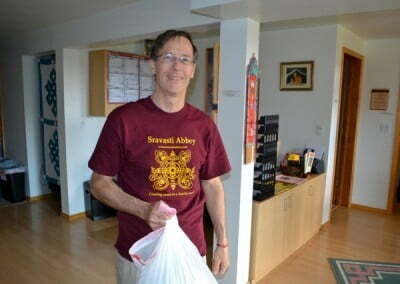 Professor Guy Newland presented the Abbey with a joyous Dharma feast. 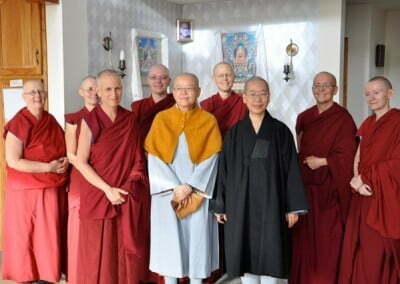 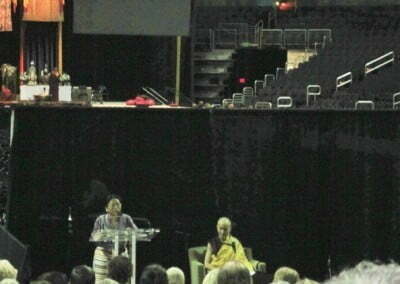 Billed as a teaching on the Madhyamka view as interpreted by the four major Tibetan Buddhist schools, Guy’s talks were interlaced with Tibetan history, a little anthropology, and great passion for his topic. 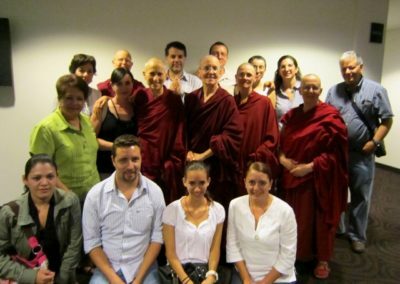 Guy’s clarity and heartfelt enthusiasm made the material fresh and accessible to the varied levels of the students that attended. 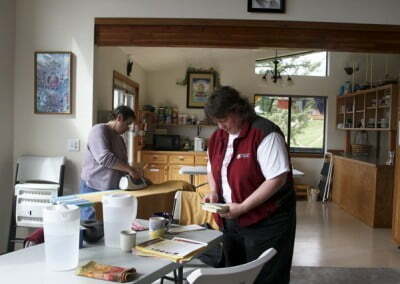 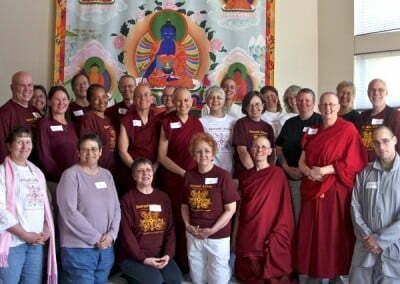 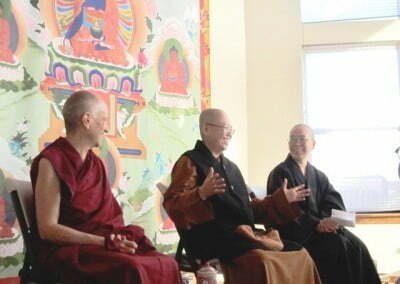 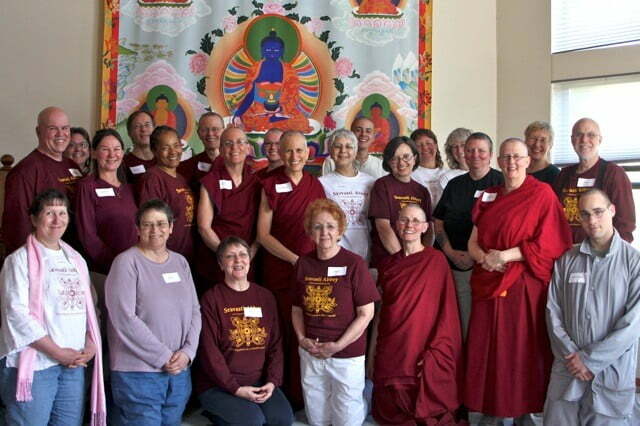 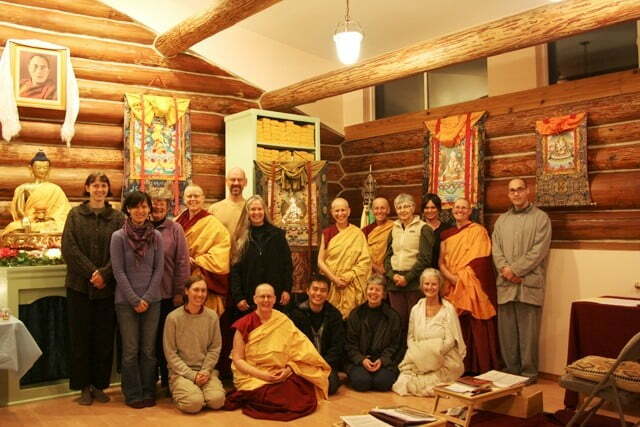 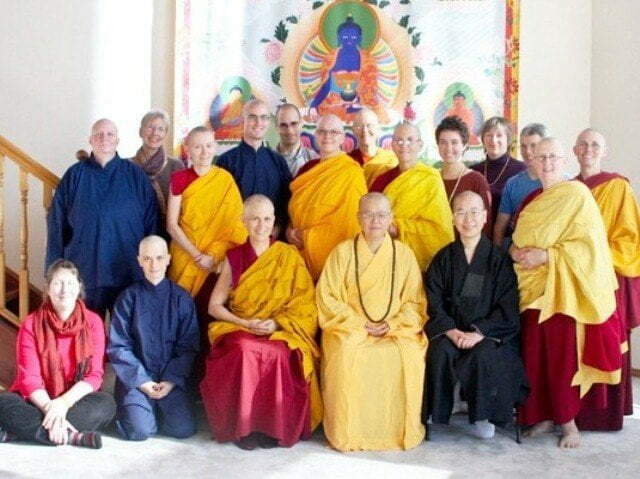 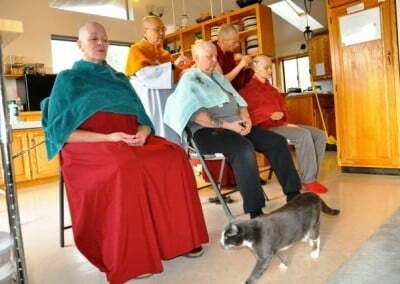 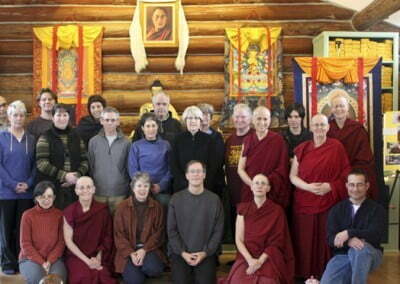 Old Dharma friends joined easily with the newer guests for stimulating discussions and practice. 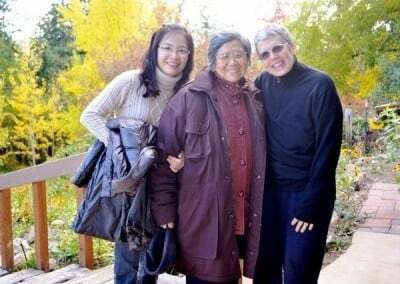 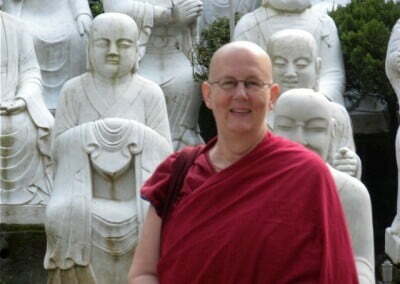 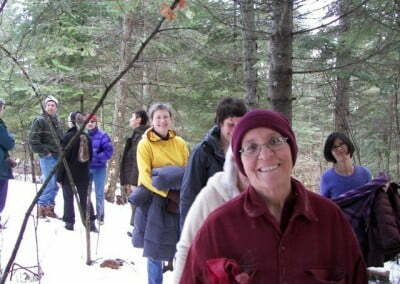 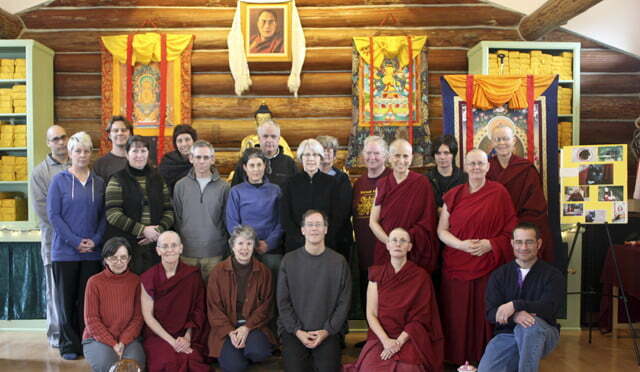 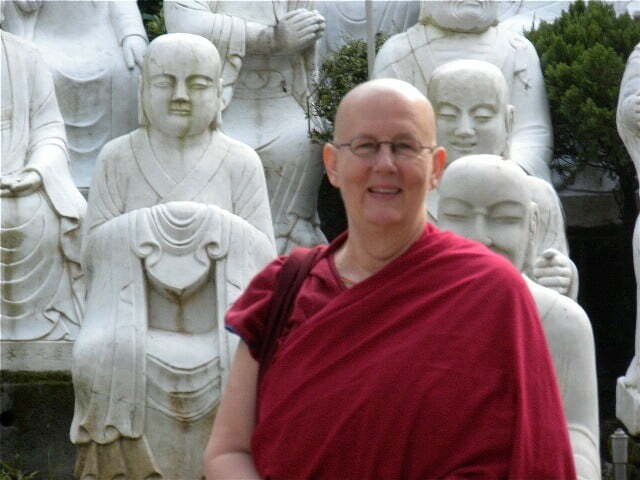 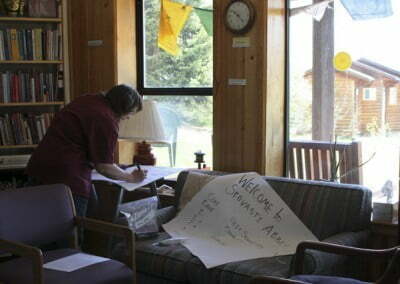 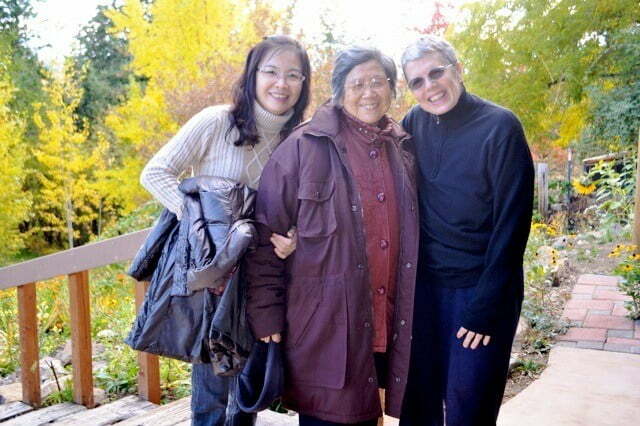 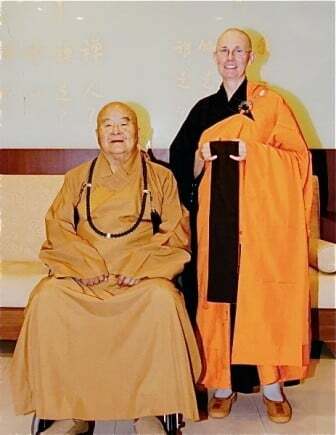 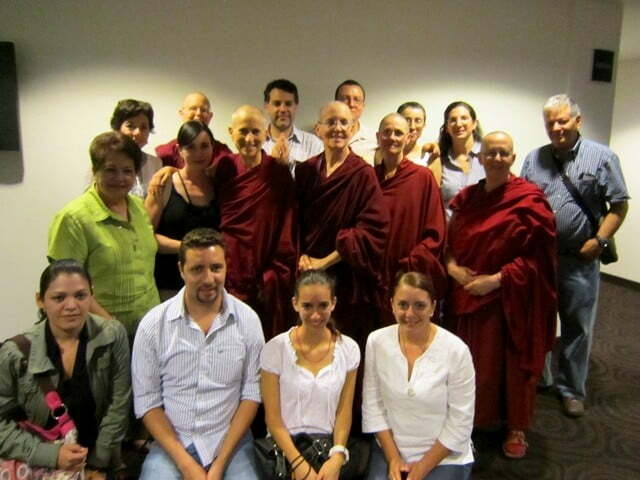 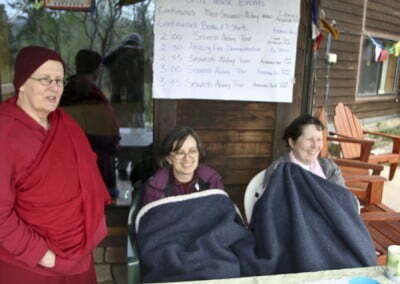 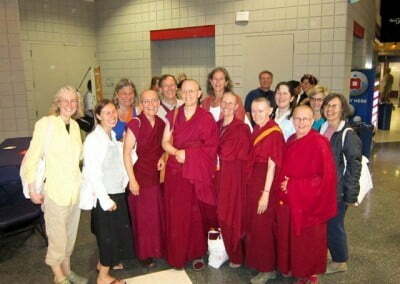 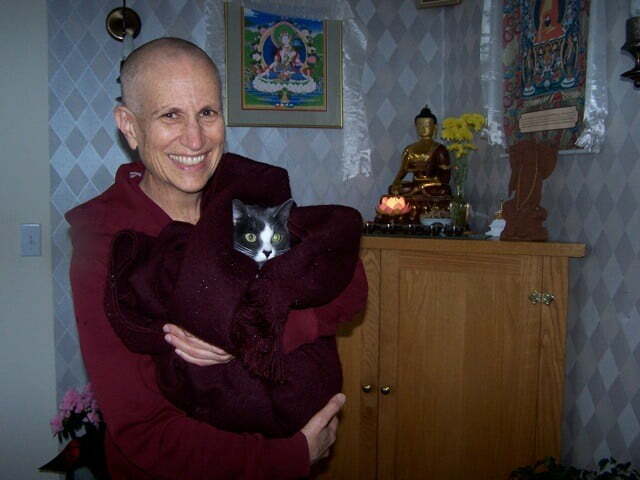 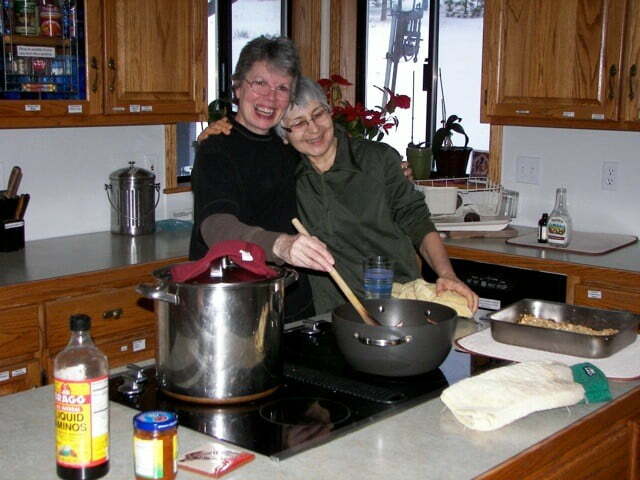 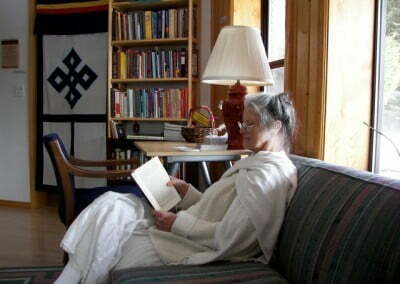 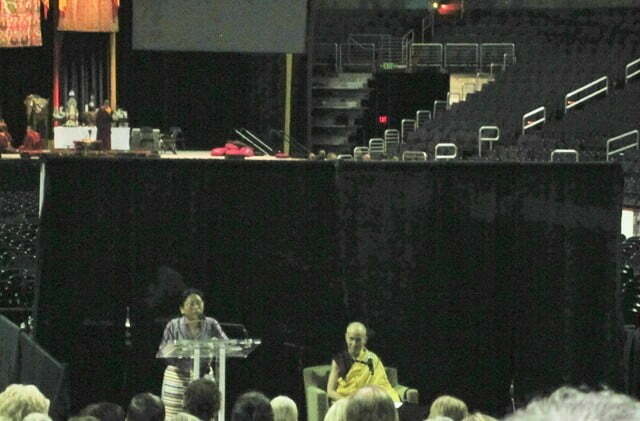 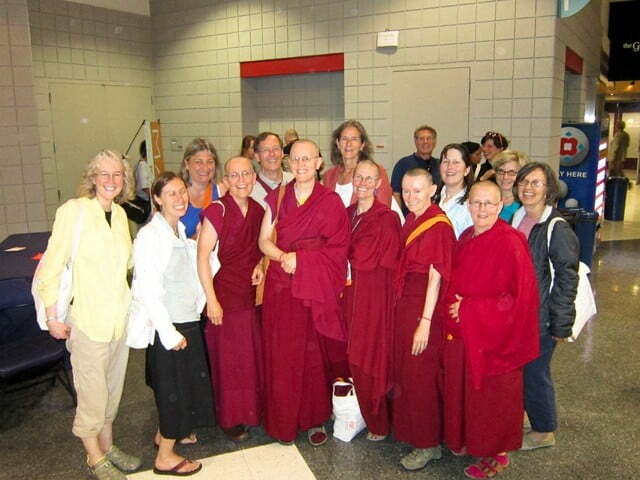 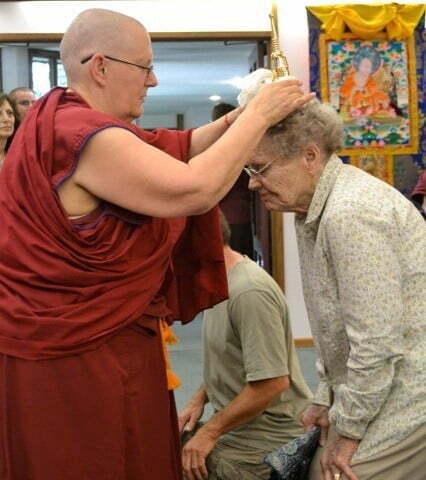 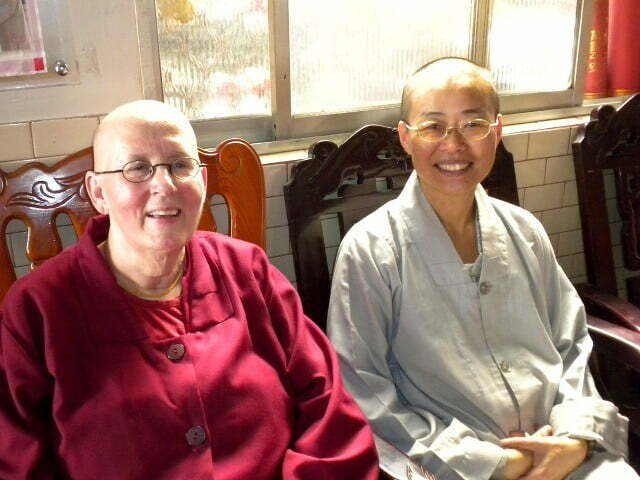 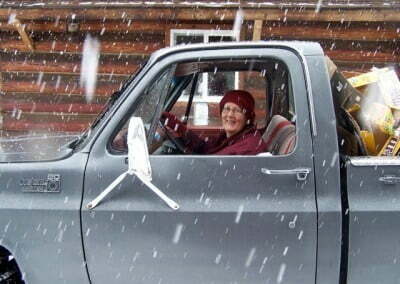 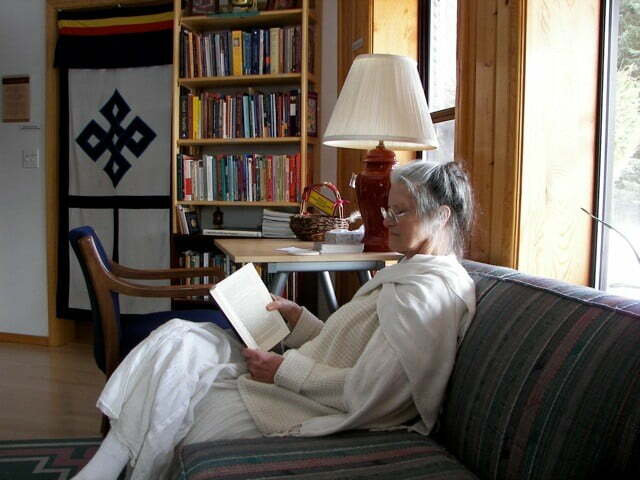 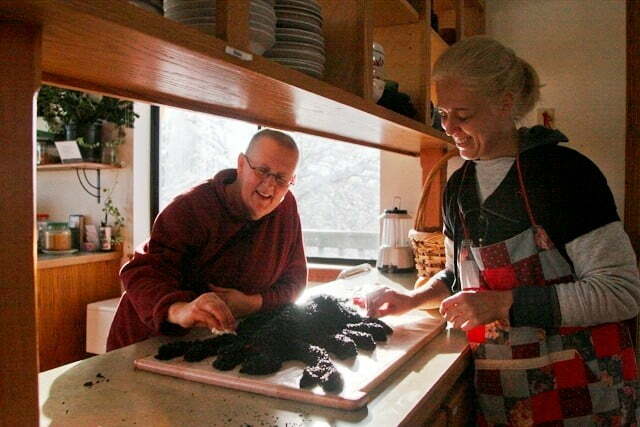 It seems like just yesterday when Venerable Chodron put us into retreat with blessings and warm advice. 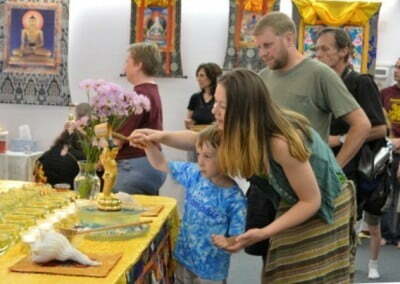 White Tara’s powerful compassion affected almost everyone who came and did retreat. 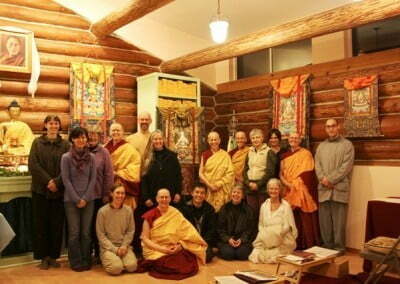 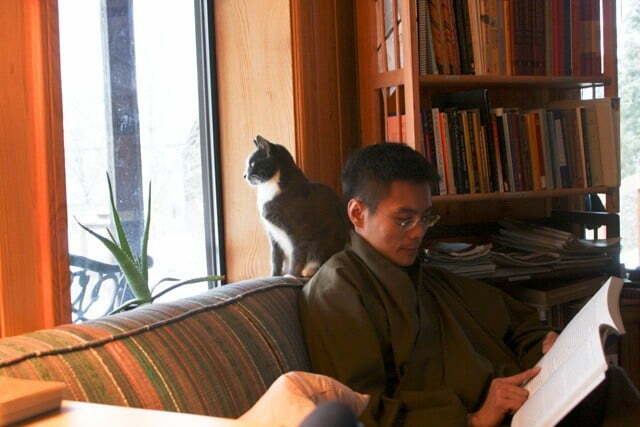 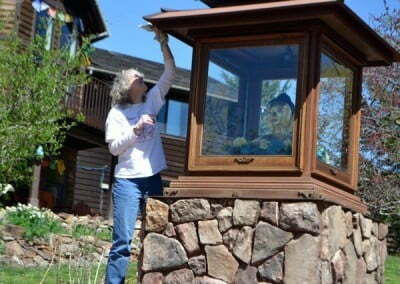 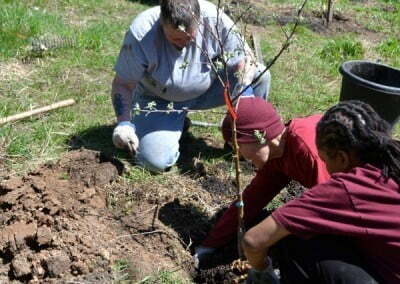 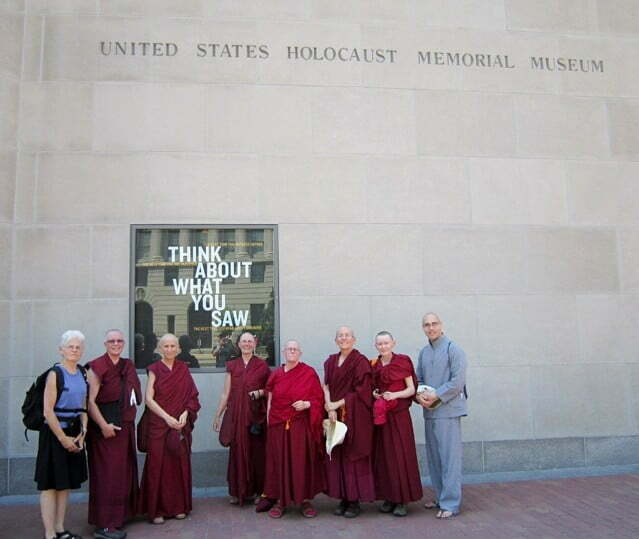 Many of us deepened our understanding of our own minds and how the Dharma works on our minds. 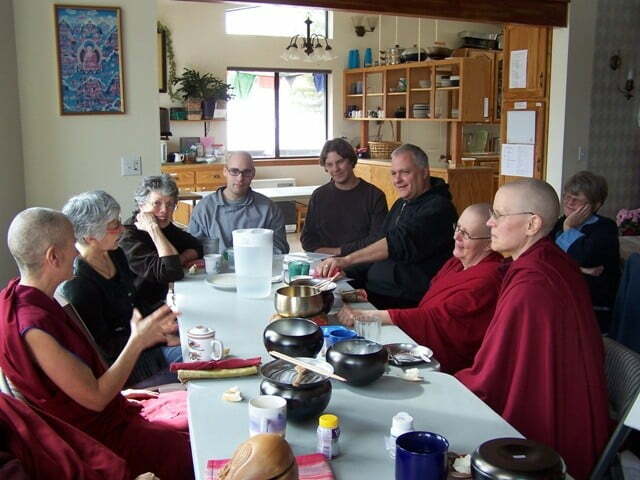 With the Bodhisattva Breakfast Corner teachings on White Tara and the Teachings on the 4 Establishments of Mindfulness to anchor our practice, it was a very fruitful time with White Tara. 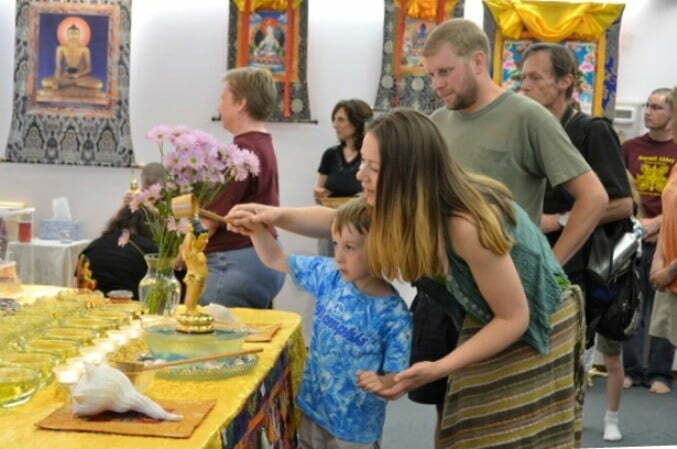 The first part of the three month retreat came to a beautiful auspicious close as the community prepared to say goodbye to guests who joined us for the one-month White Tara retreat. 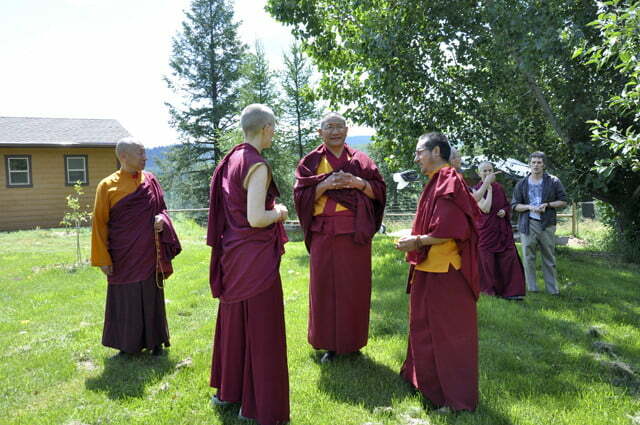 A stunning morning welcomed the retreatants as they offered all their destructive karma to the fiery, wrathfully compassionate Buddha, Dorje Khadro, who accepts them with delight. 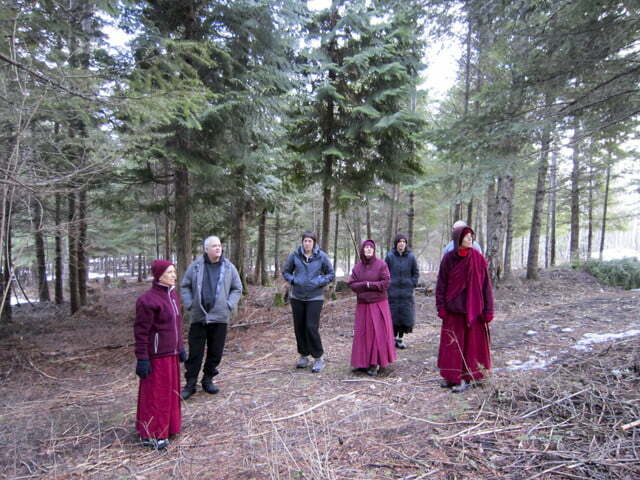 We all felt joyful and inspired after this powerful purification practice which marks the ending of a retreat.